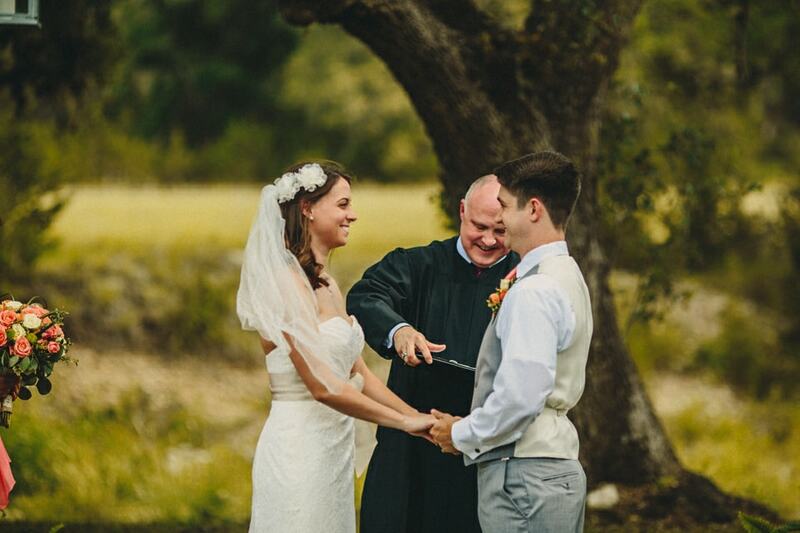 Taylor and Warren got married at the Pecan Springs Ranch, a beautiful Austin event venue located on 17 naturally stunning acres. 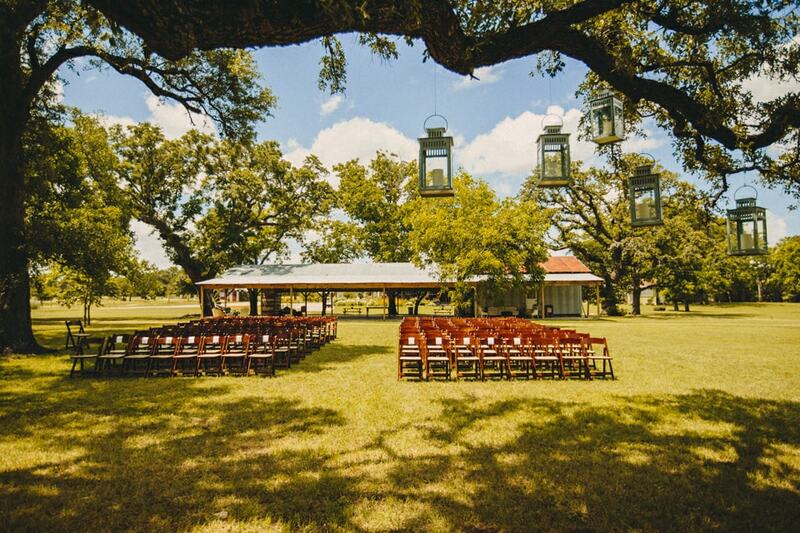 Surrounded by stunning pecan and oak trees, the property also features a creek, fresh springs and a pond. 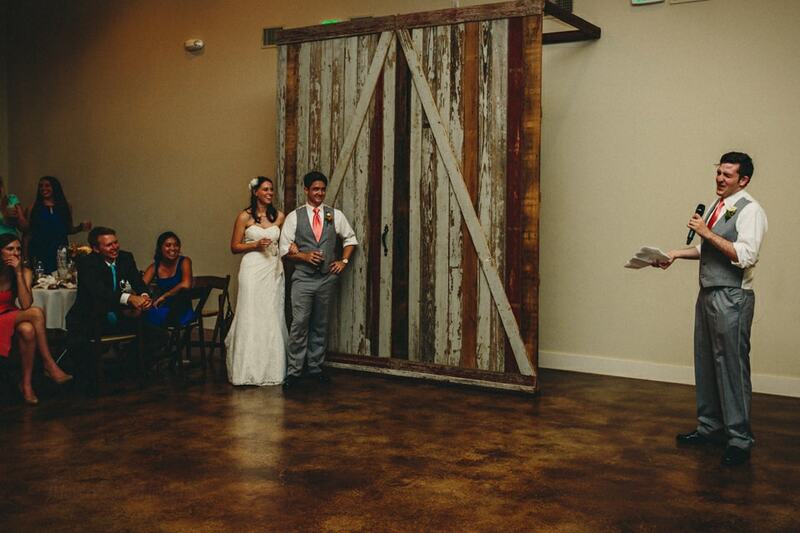 A beautiful climate-controlled building includes a prep kitchen, a groom’s area, and a glass back wall that opens up onto a 2000 square foot terrace, bringing the outside “in”. 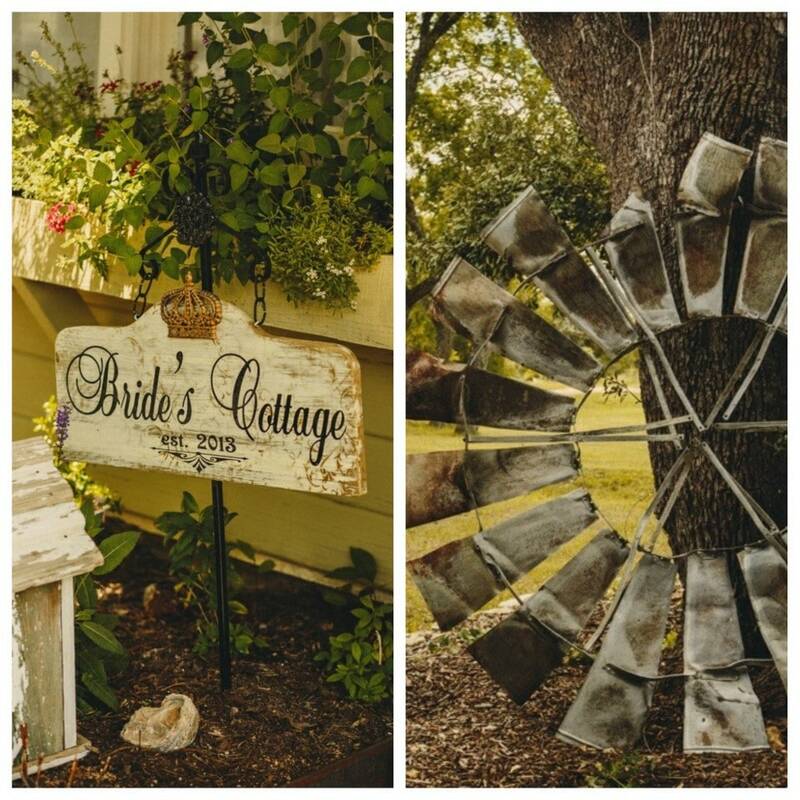 They also a separate bride’s house as well as numerous beautiful ceremony sites around the property. 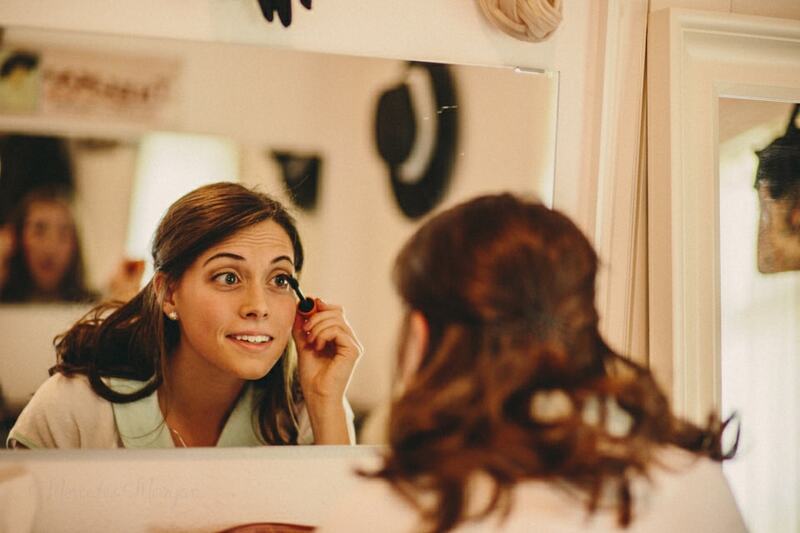 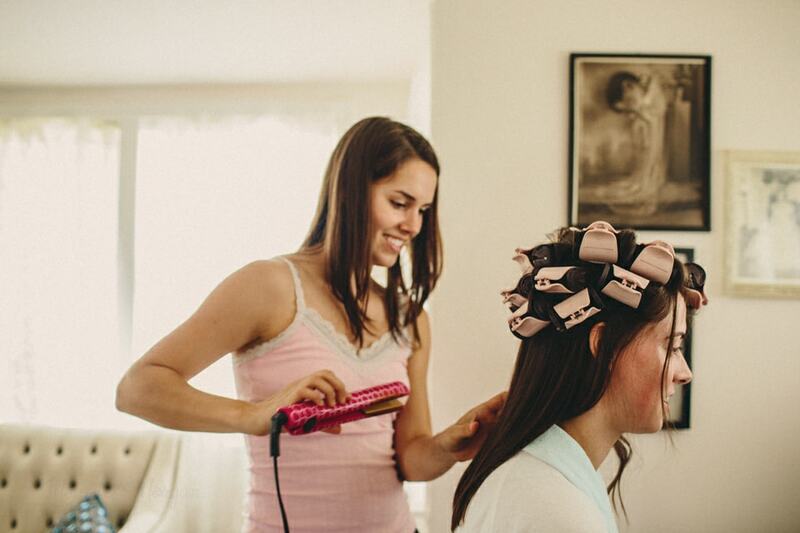 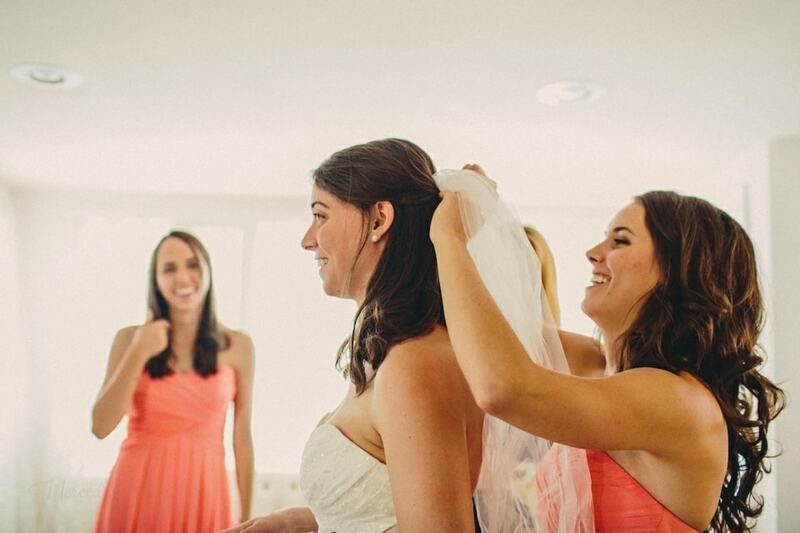 The day started with Taylor, her family, and Bridesmaids getting ready in the Brides house away from the hustle and bustle while Warren and his Groomsmen got ready in the Grooms area.. 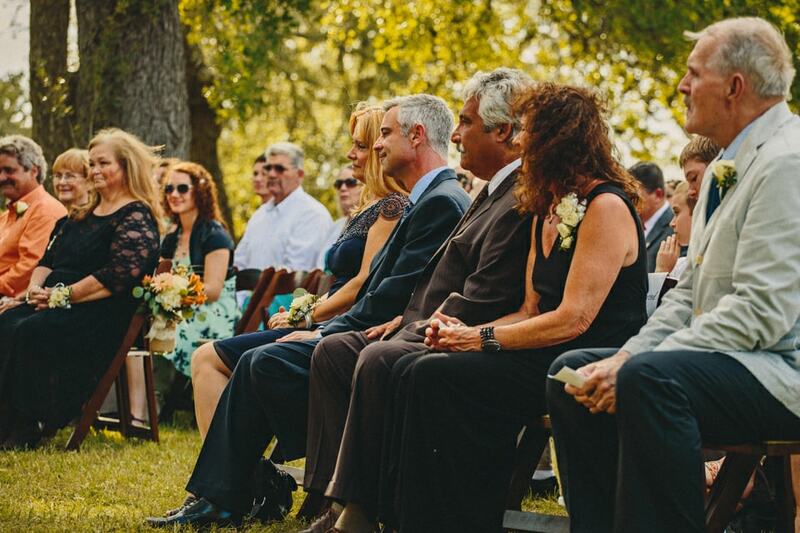 The wedding was particularly poignant and emotional because Taylor’s dad had passed away, and so he was very much missed. 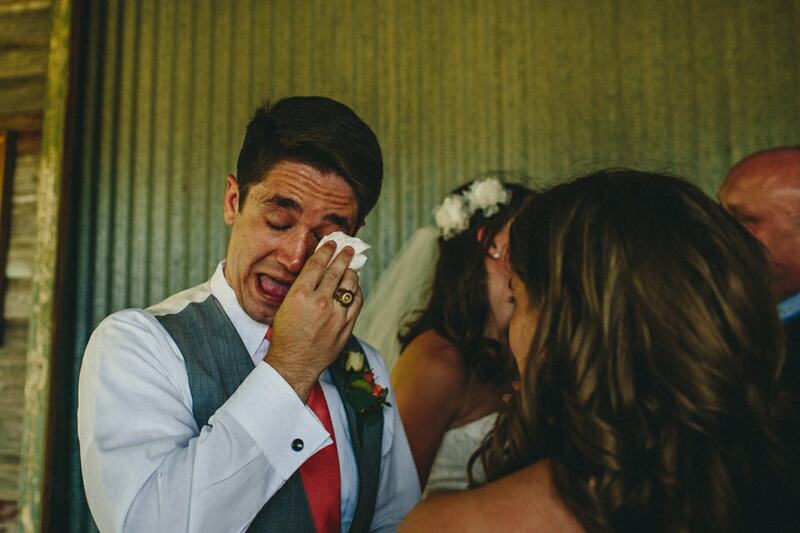 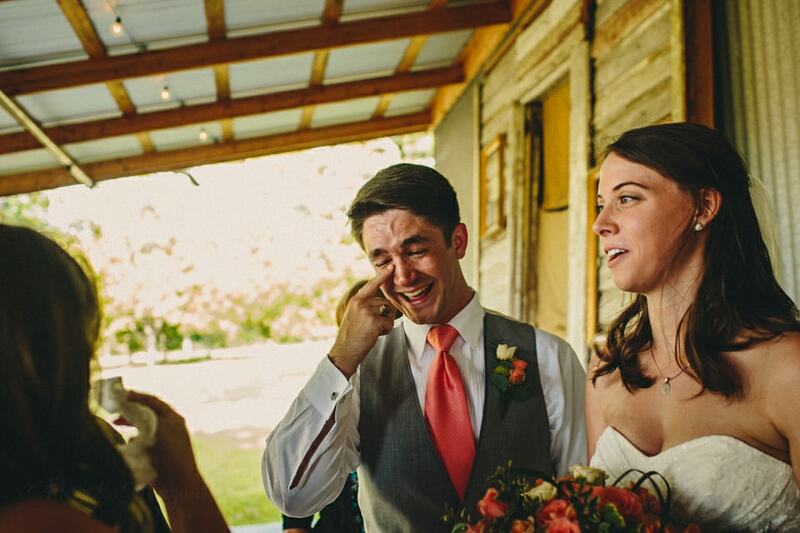 Taylor was definitely emotional due to this, but Warren was the one left in tears at the end of the ceremony! 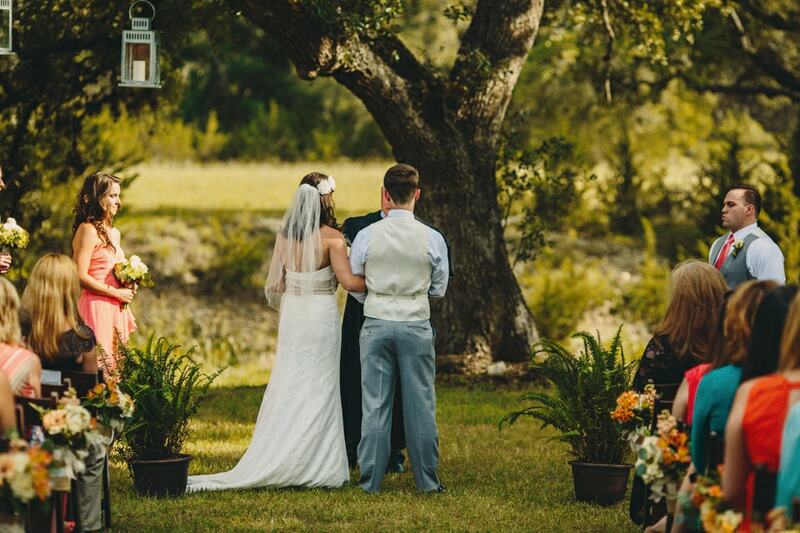 The couple are very laid back and adore their families and their tenderness towards each other was so very apparent during their ceremony which was held outdoors under a large gnarly tree with family and friends looking on. 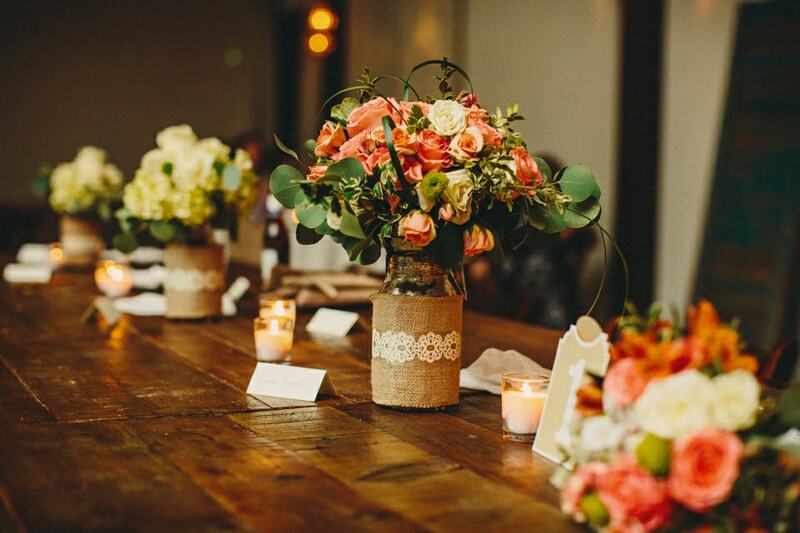 The aisle was lined with gorgeous florals by Flowers Flowers Inc who also created the stunning bridal and bridesmaid bouquets and table arrangements. 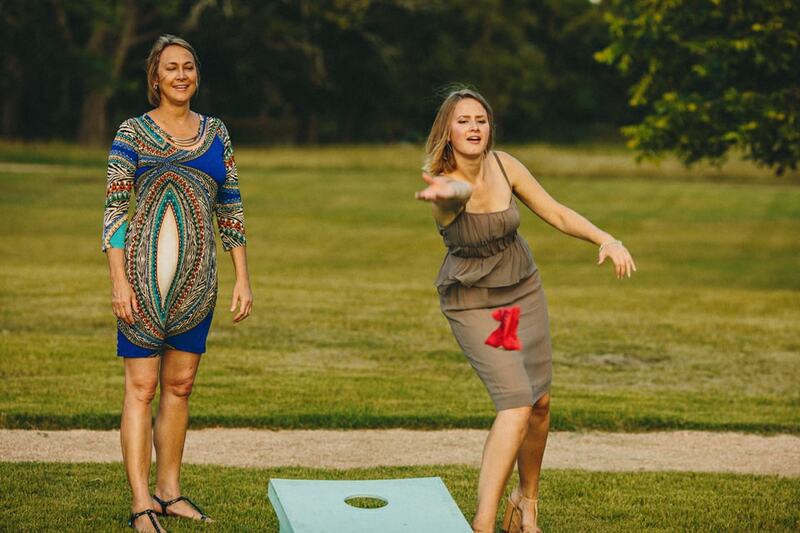 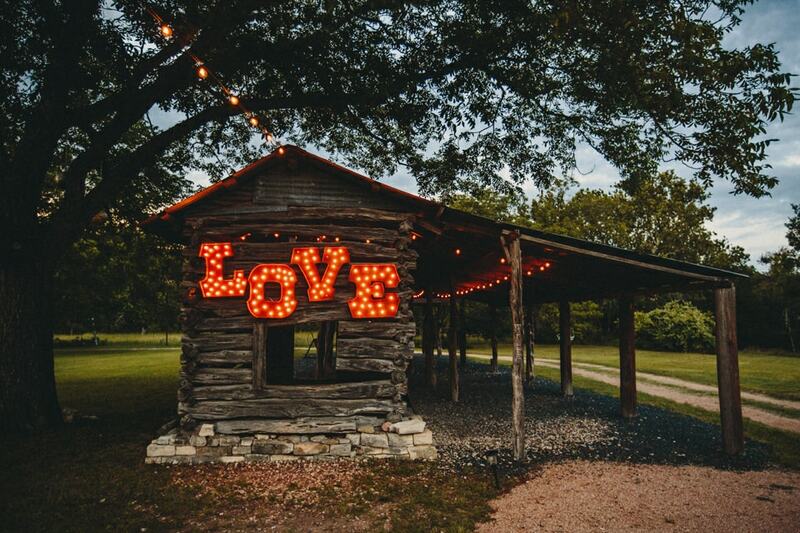 Following the ceremony guests enjoyed garden games like jenga, croquet and corn hole while the Bride and Groom stole away for some portraits which were not complete without a stop by the marquee LOVE letters at the historic loveshack. 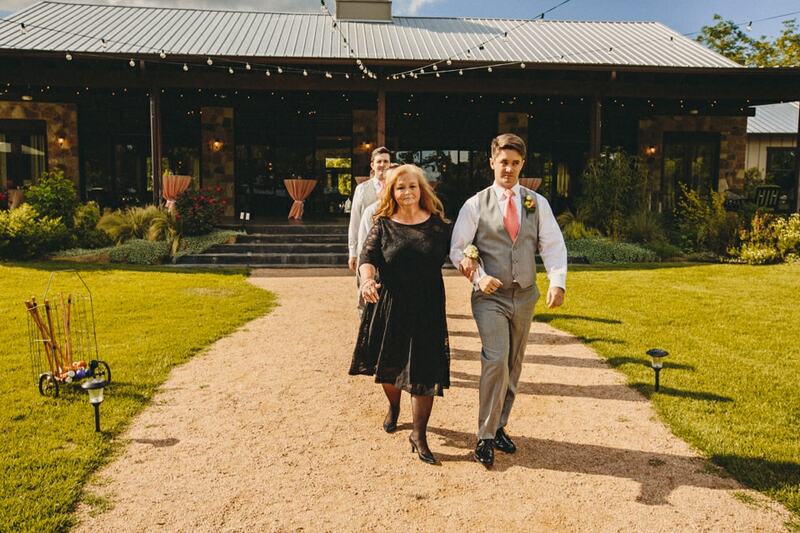 Their wedding details and styling were beautiful, elegant and timeless with a colour palette of soft peach and ivory adorning the ranch. 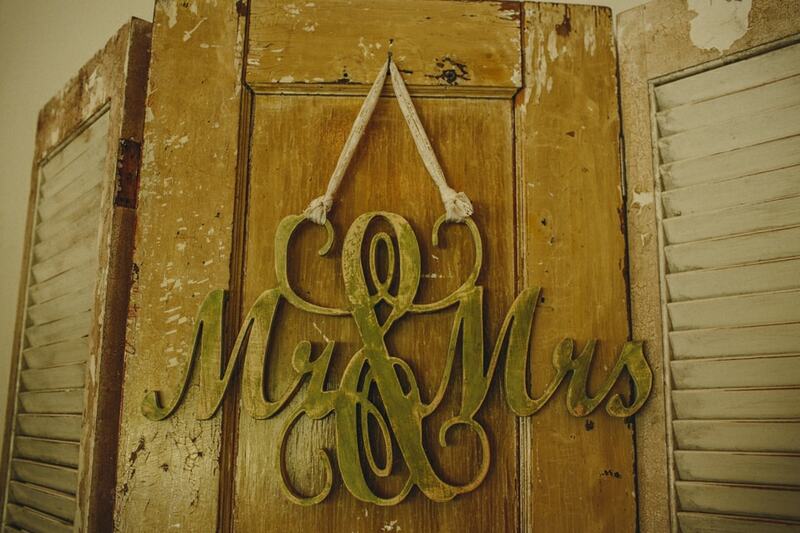 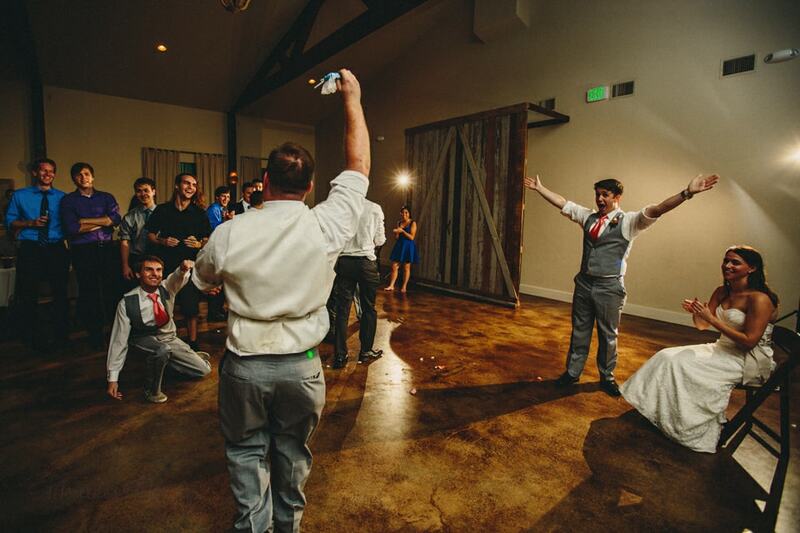 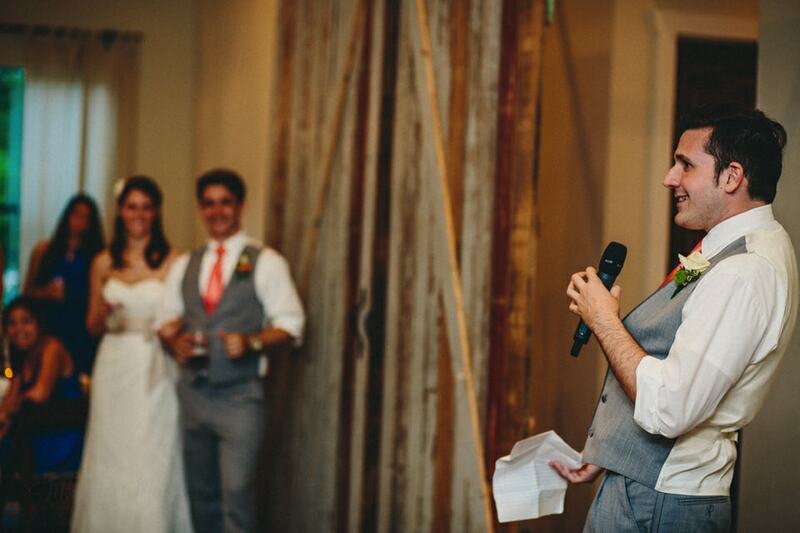 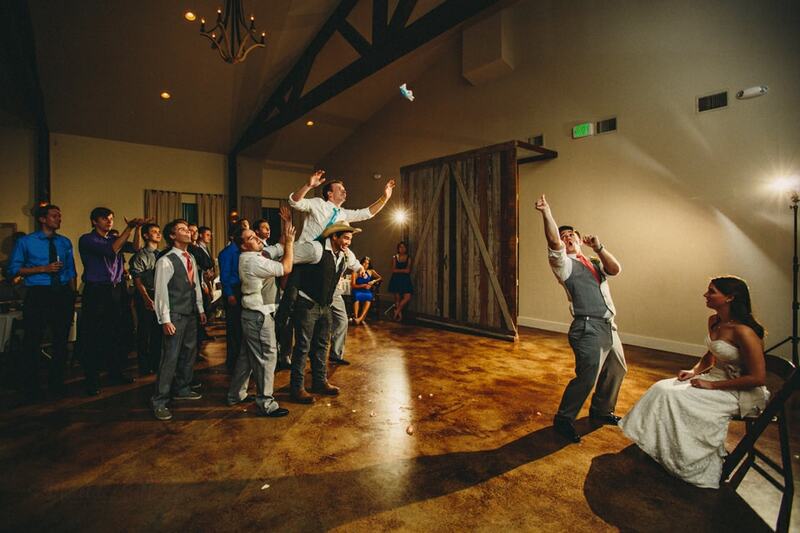 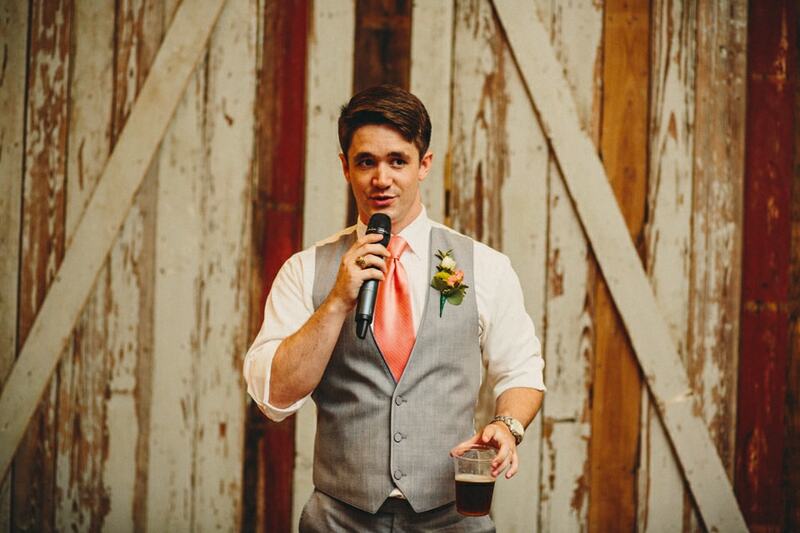 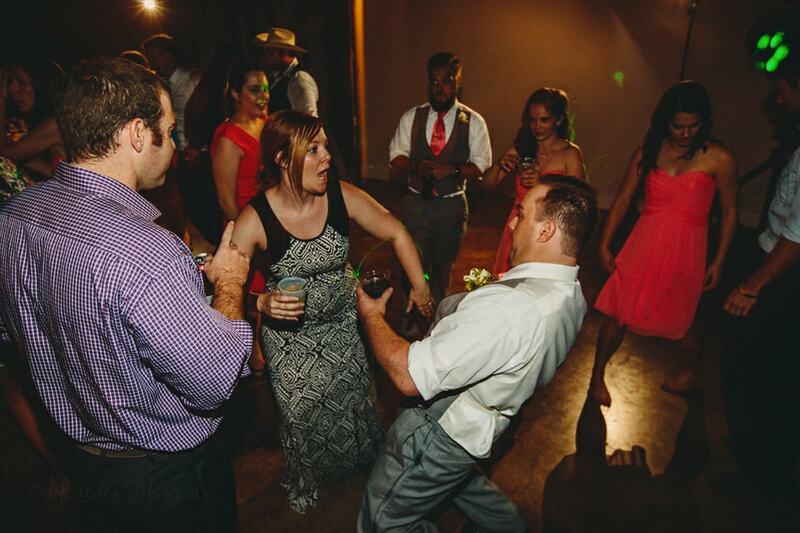 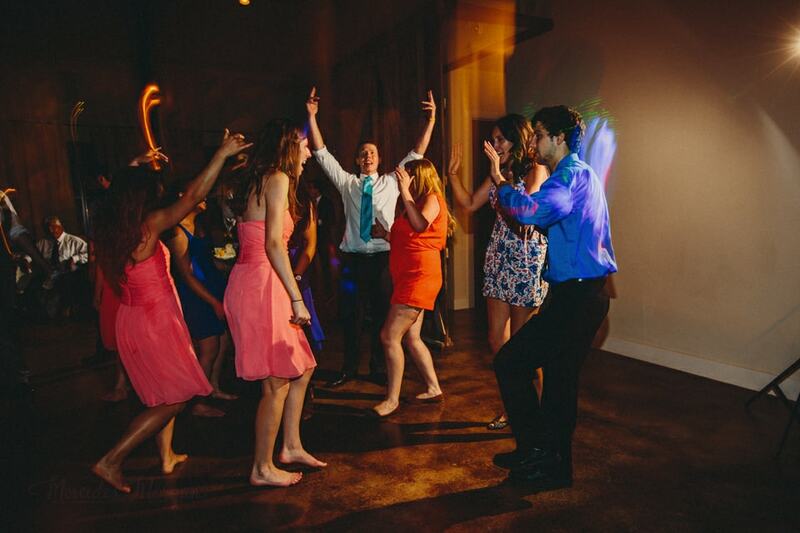 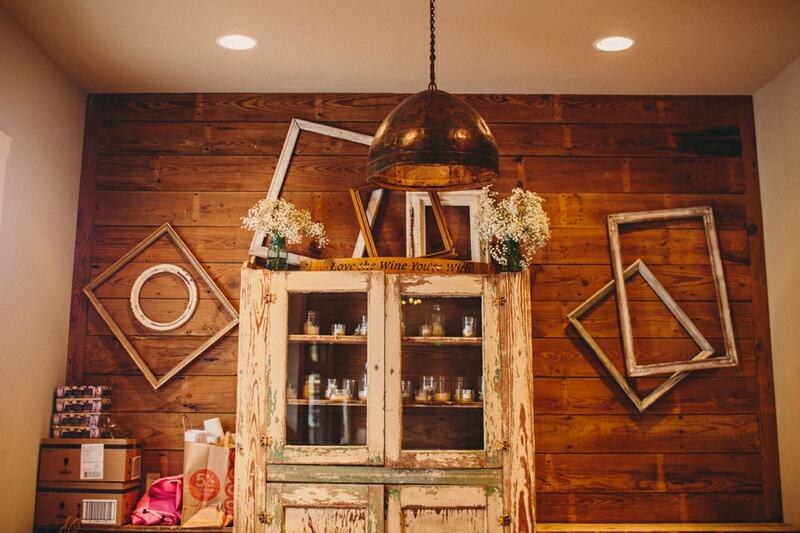 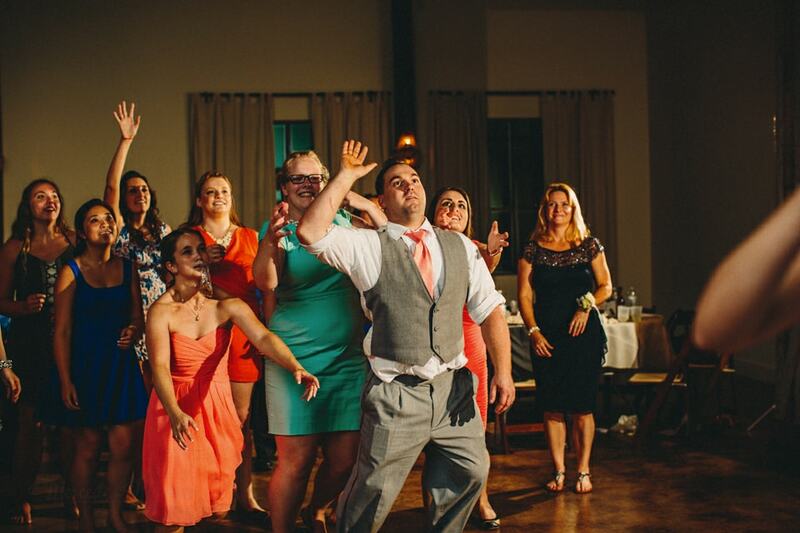 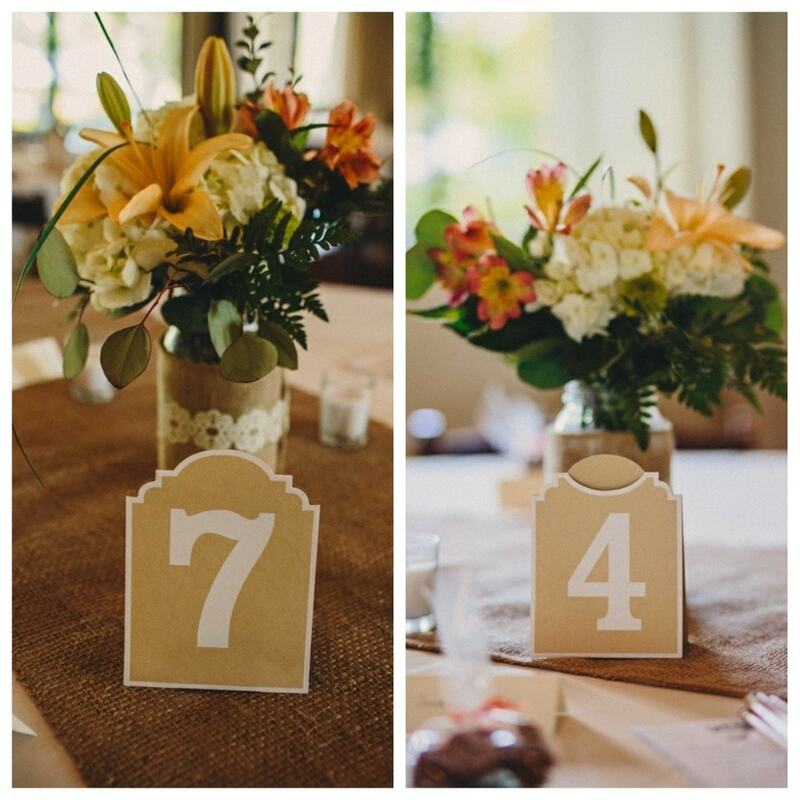 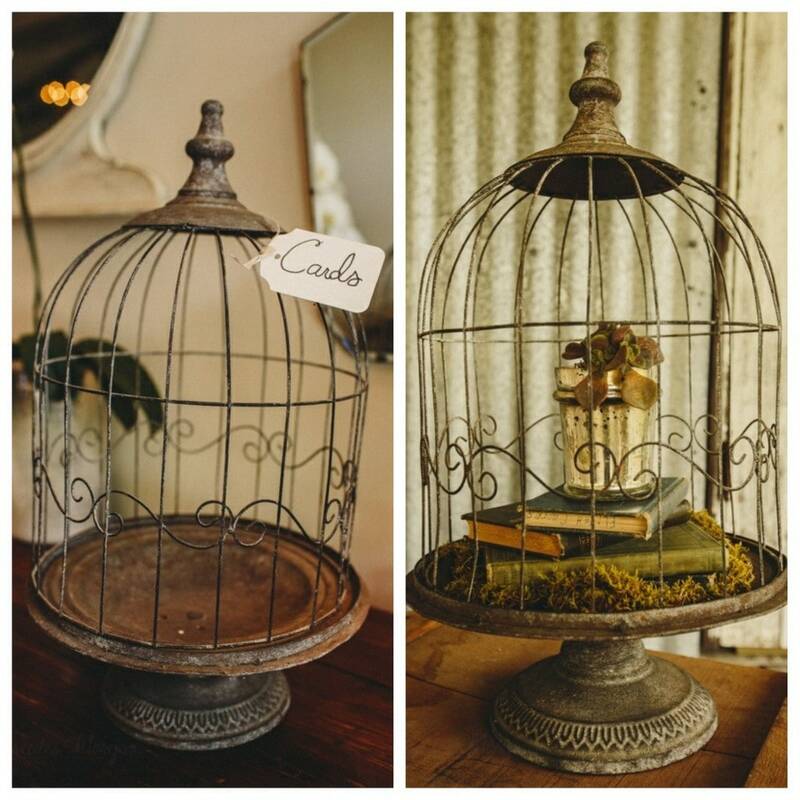 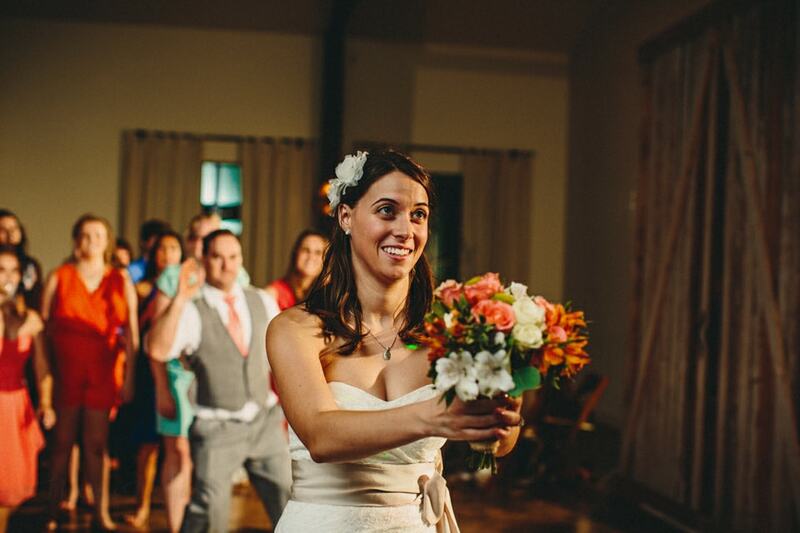 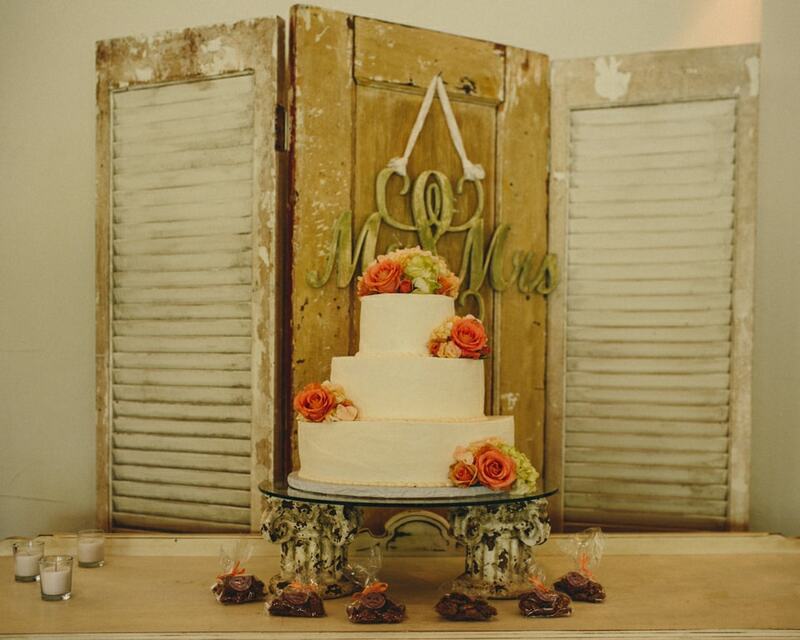 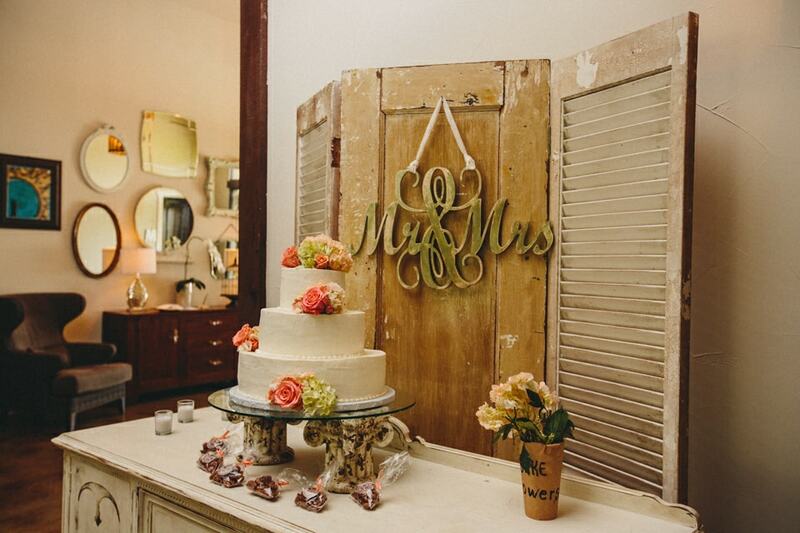 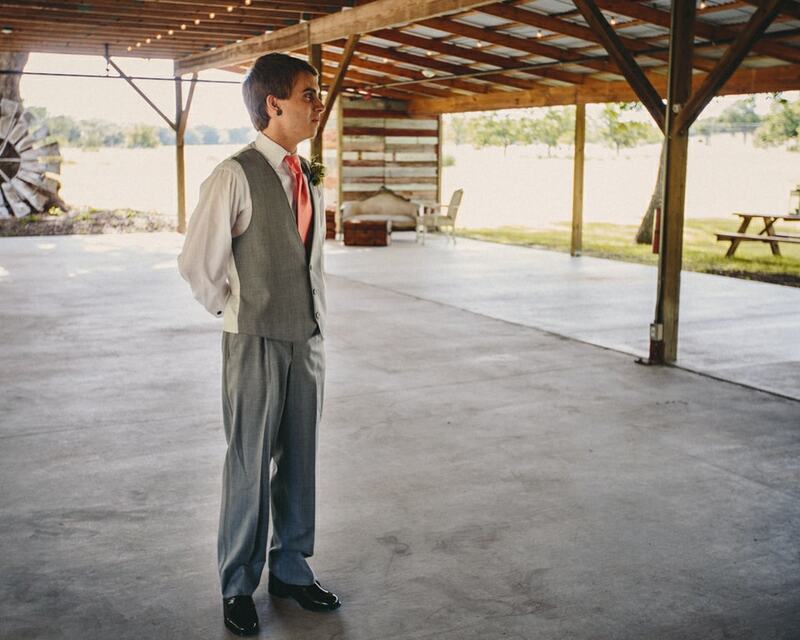 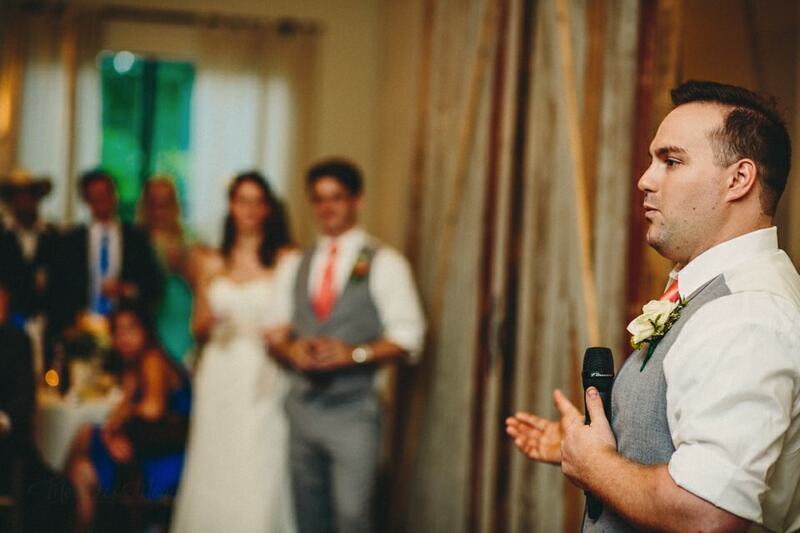 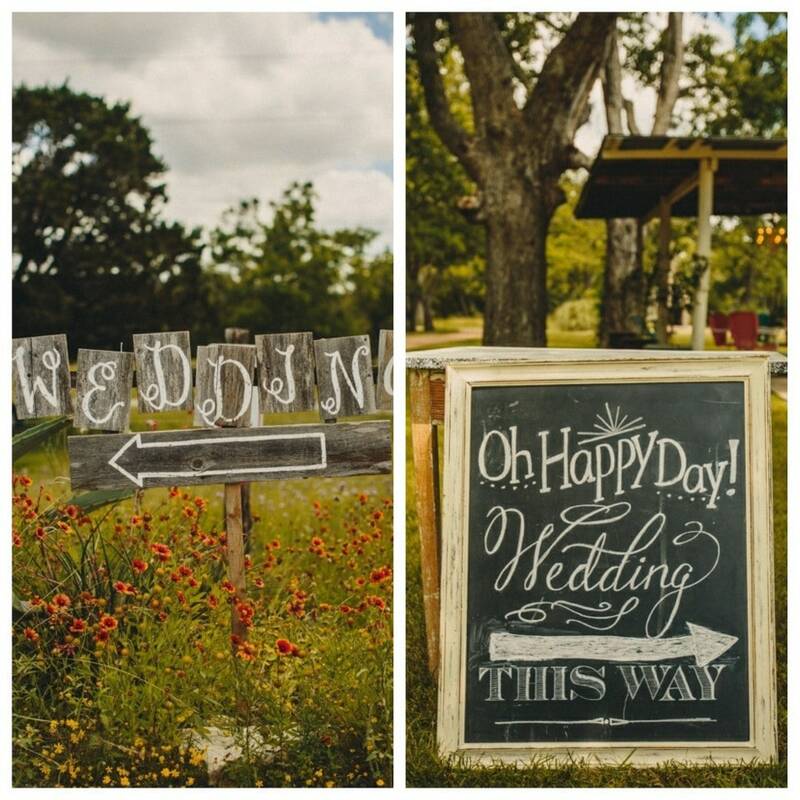 There were so many pretty rustic touches around their day that made the reception warm and welcoming and fun. 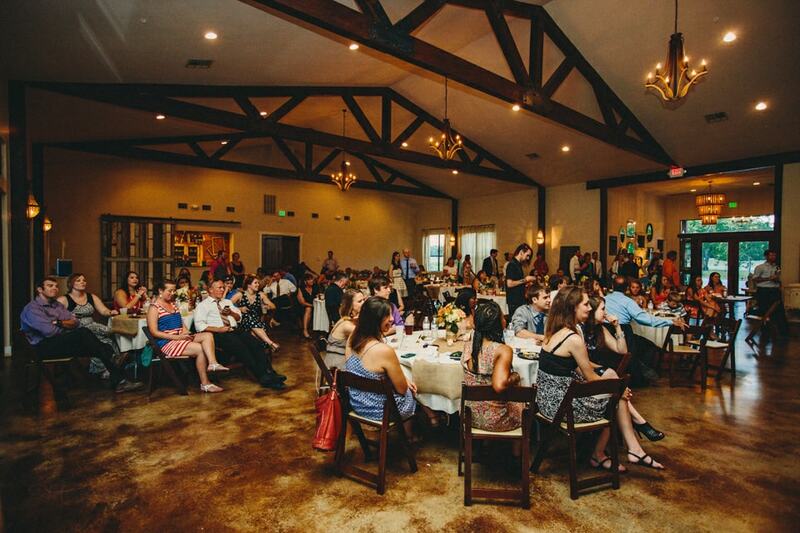 Wholesome food catered by Trudy’s followed, and then the speeches before the dancing and festivities really kicked off. 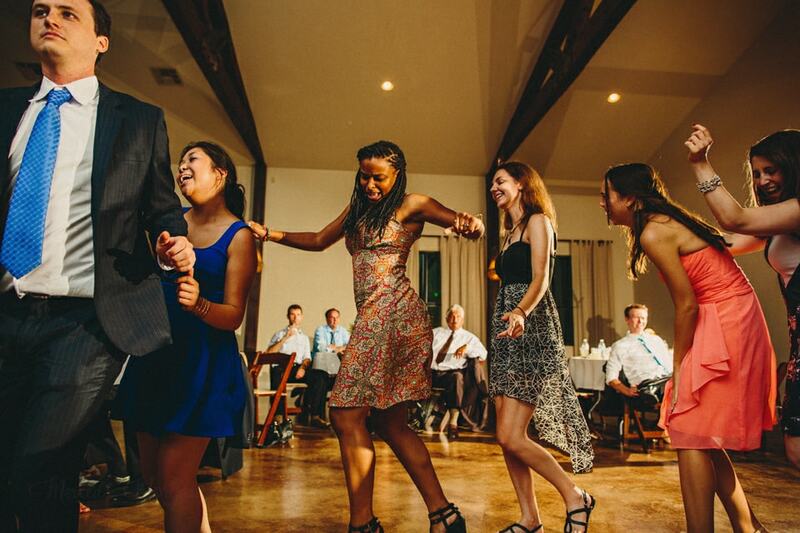 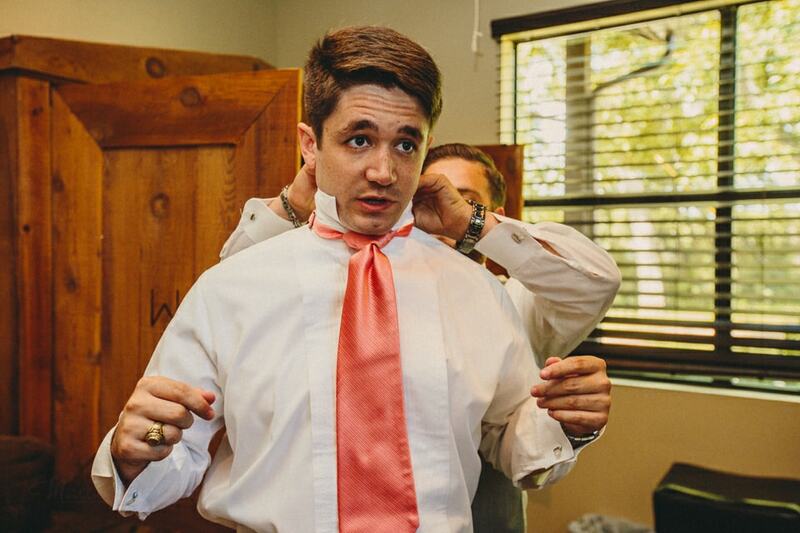 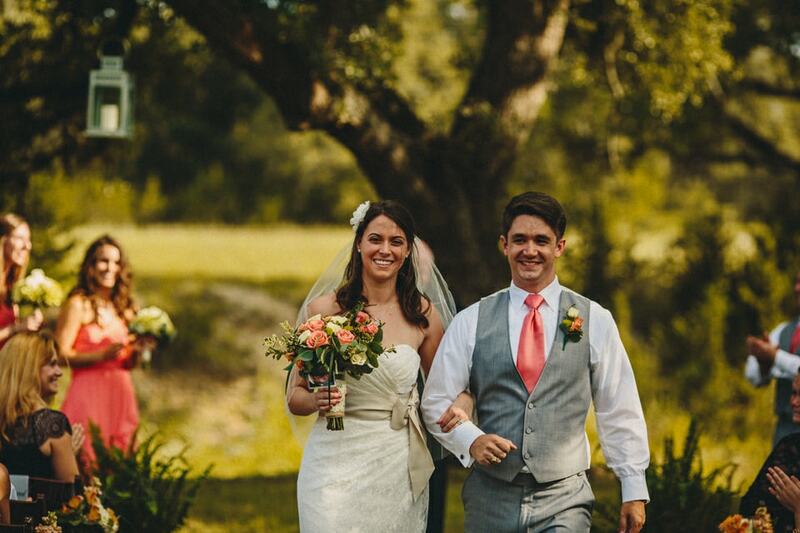 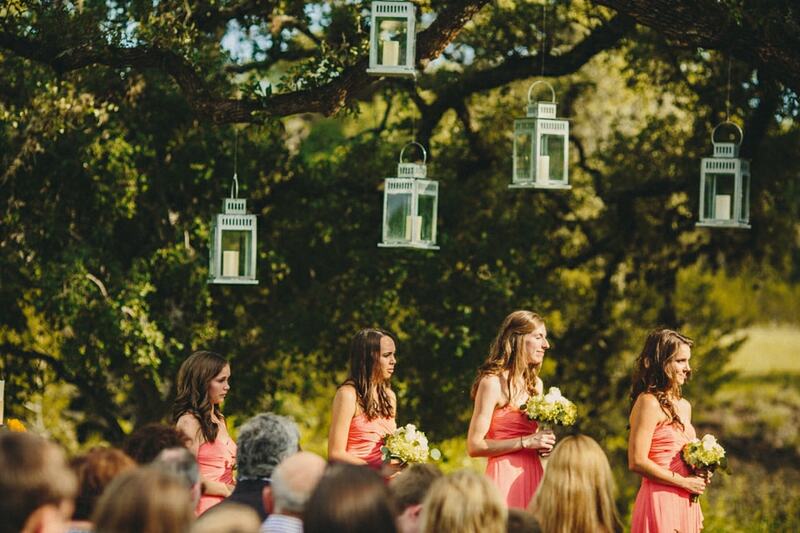 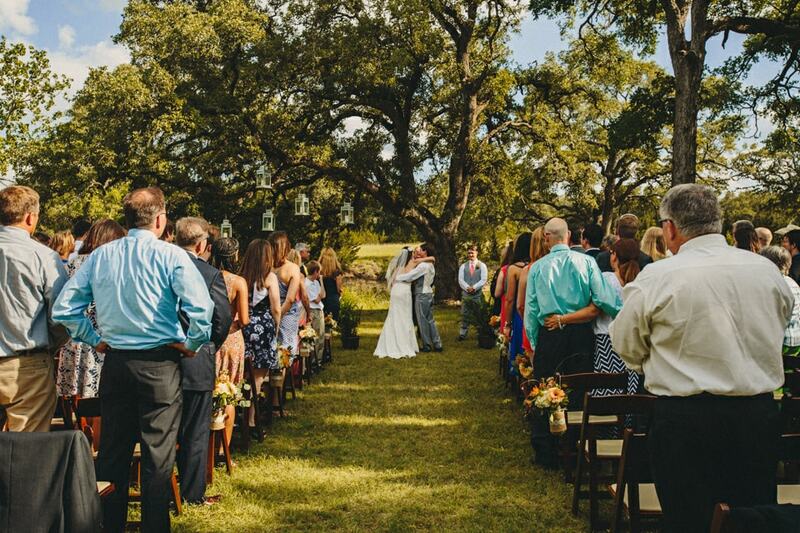 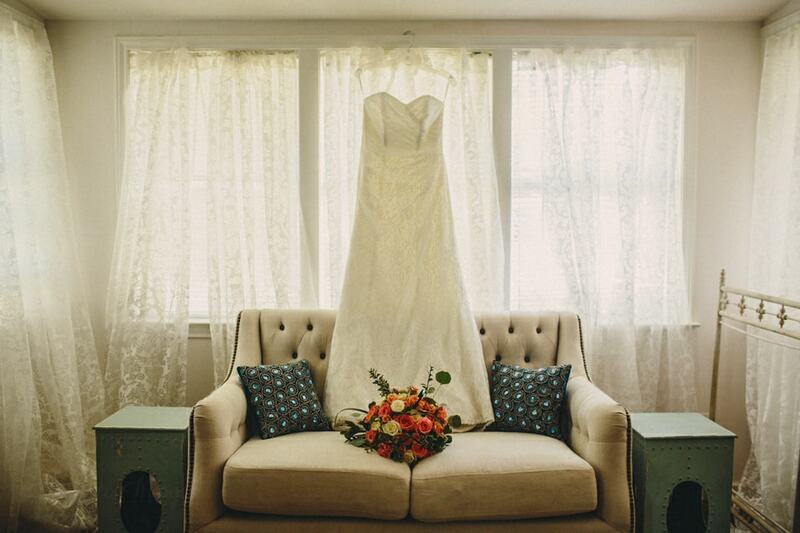 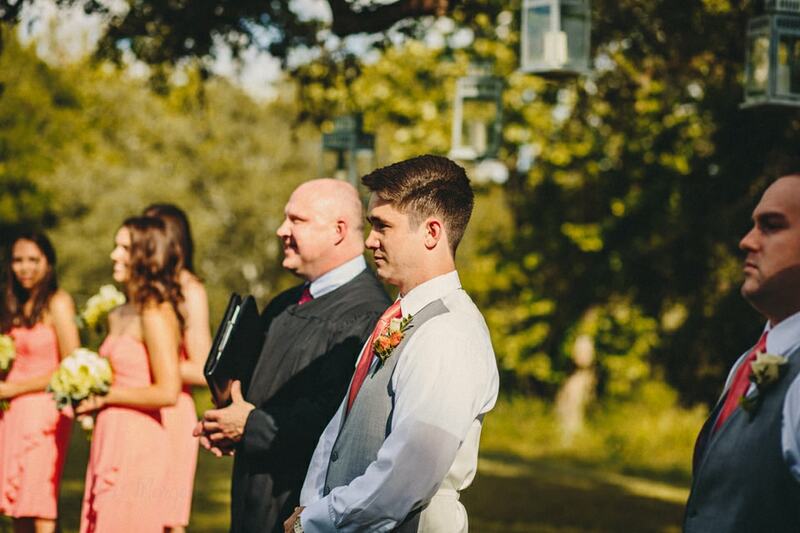 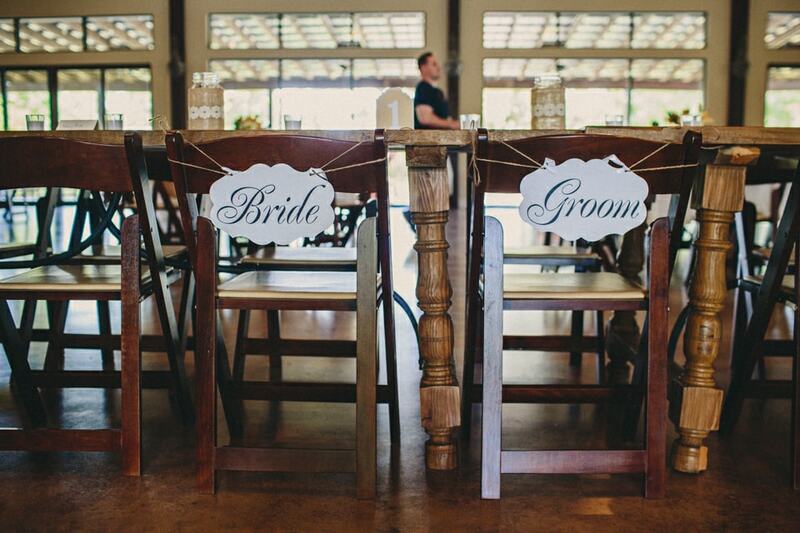 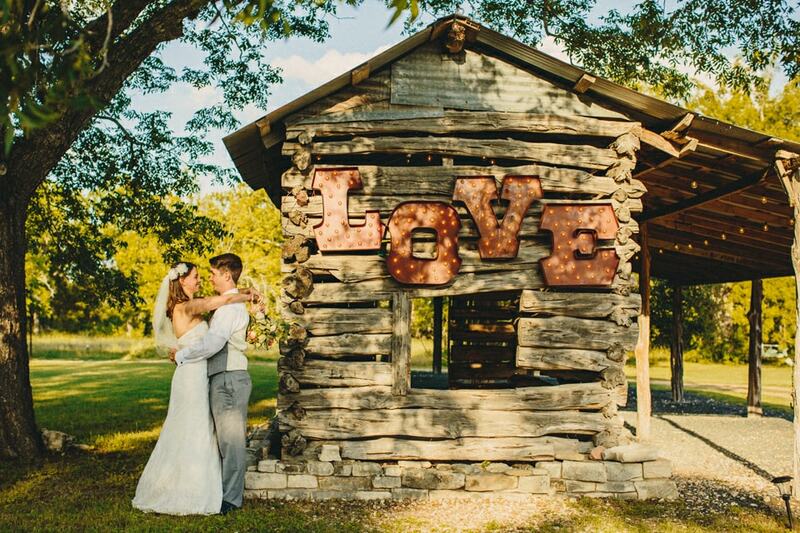 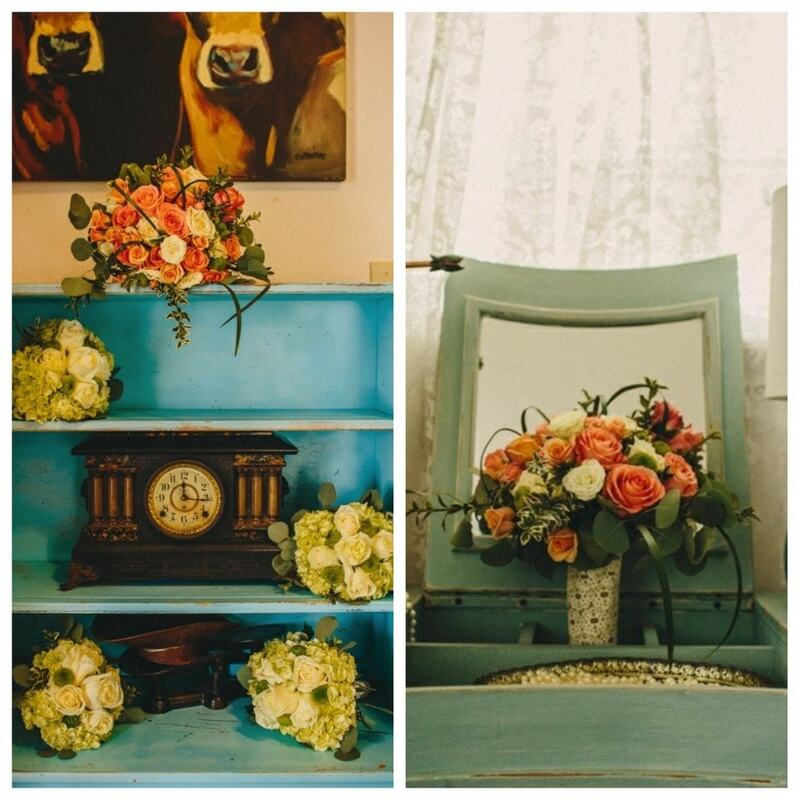 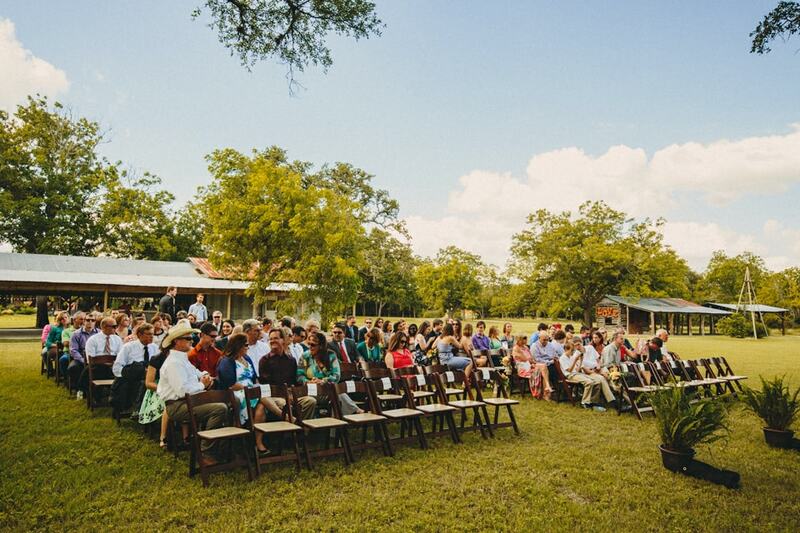 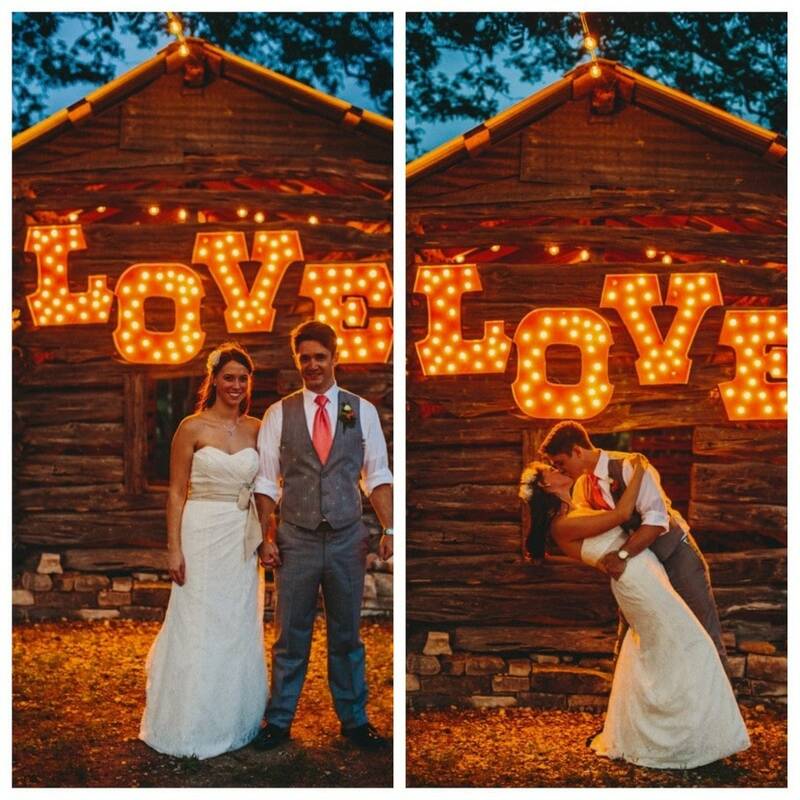 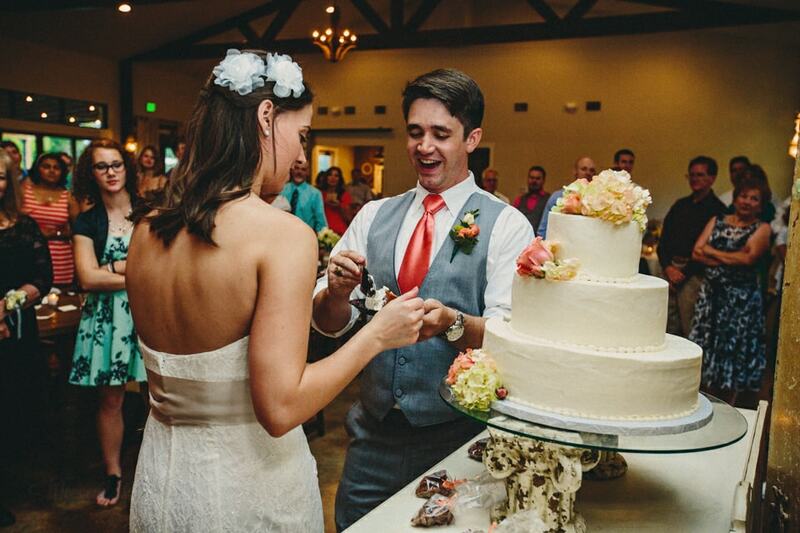 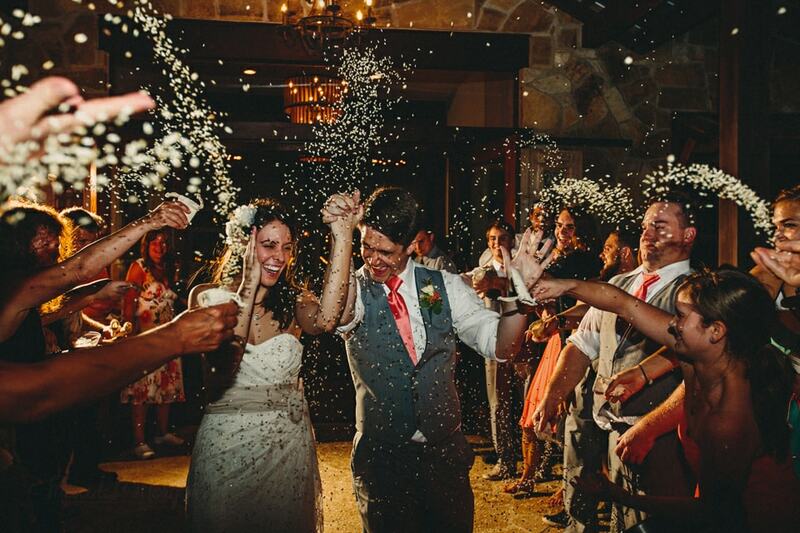 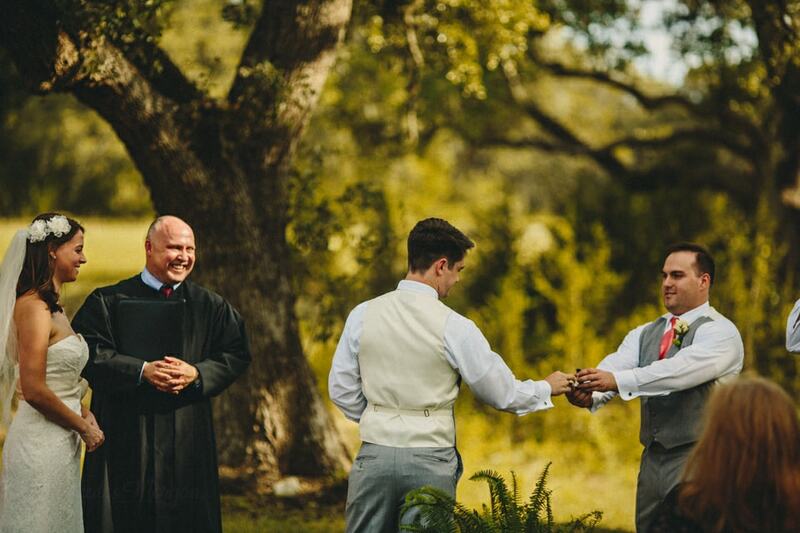 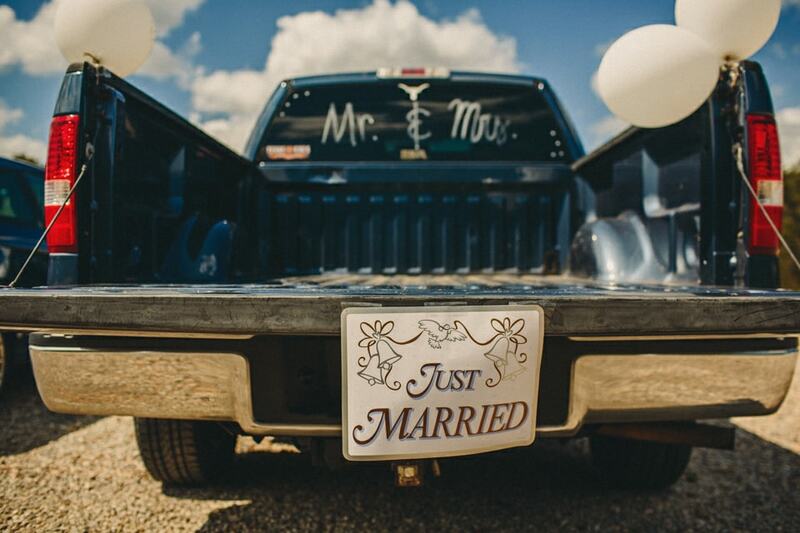 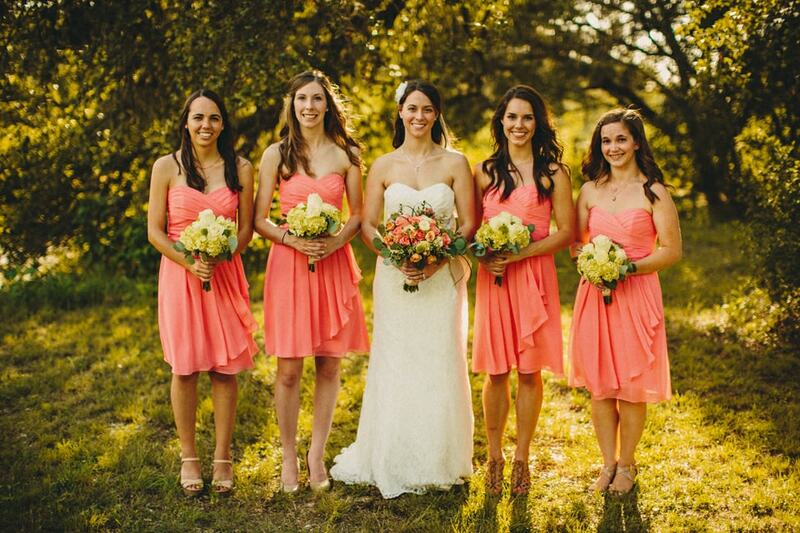 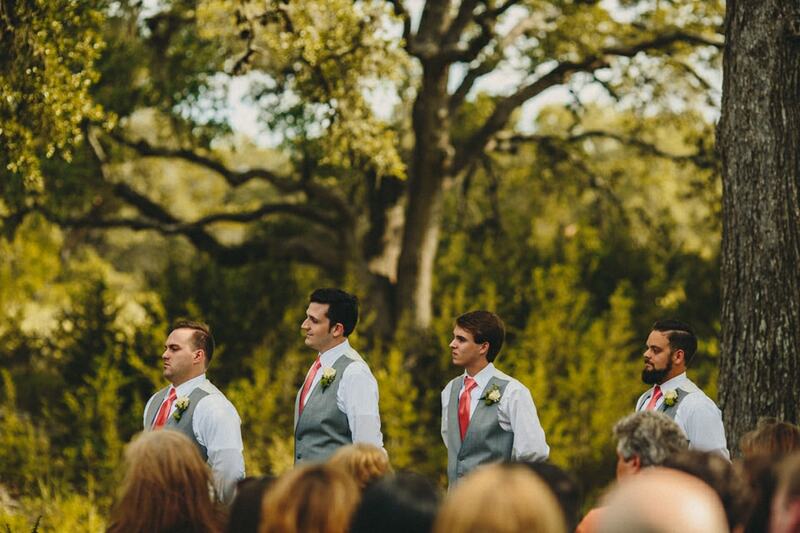 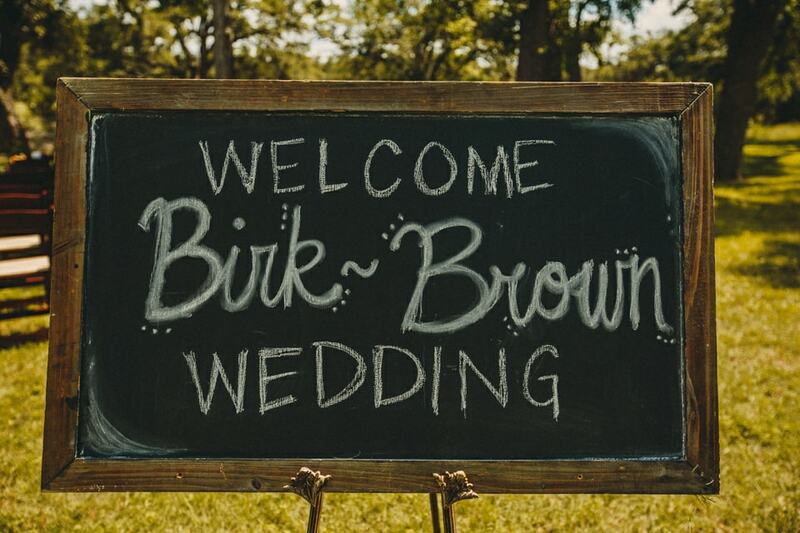 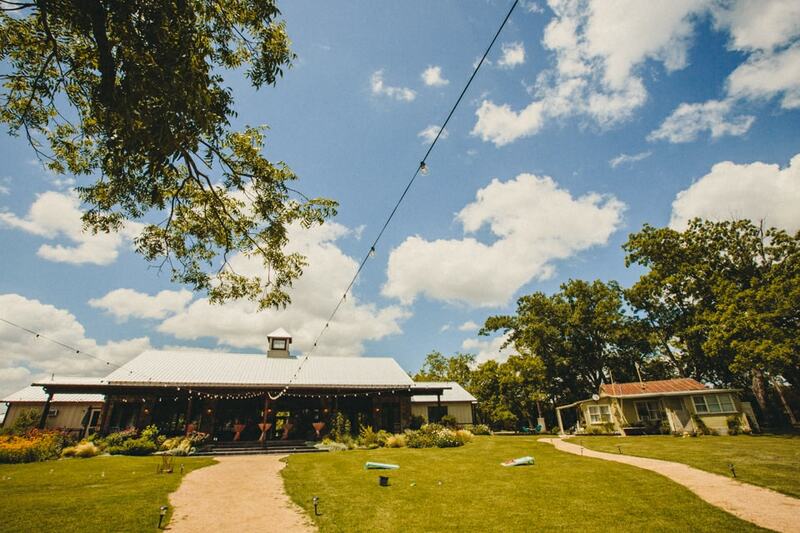 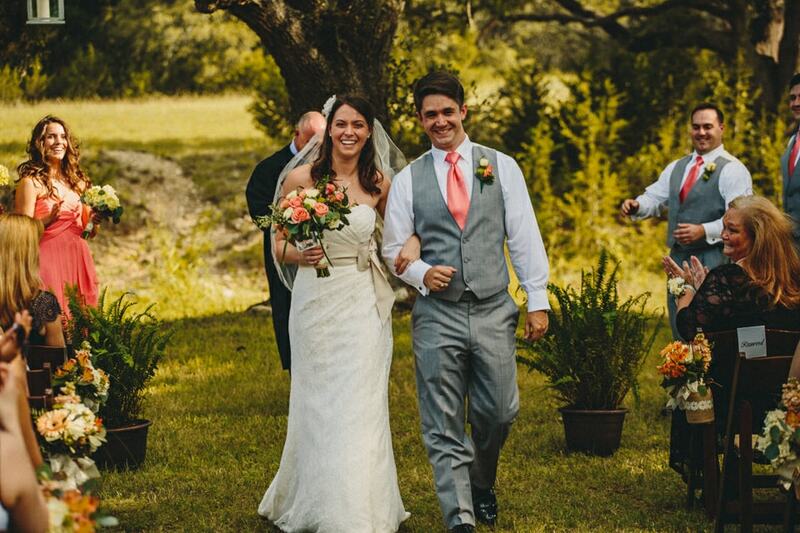 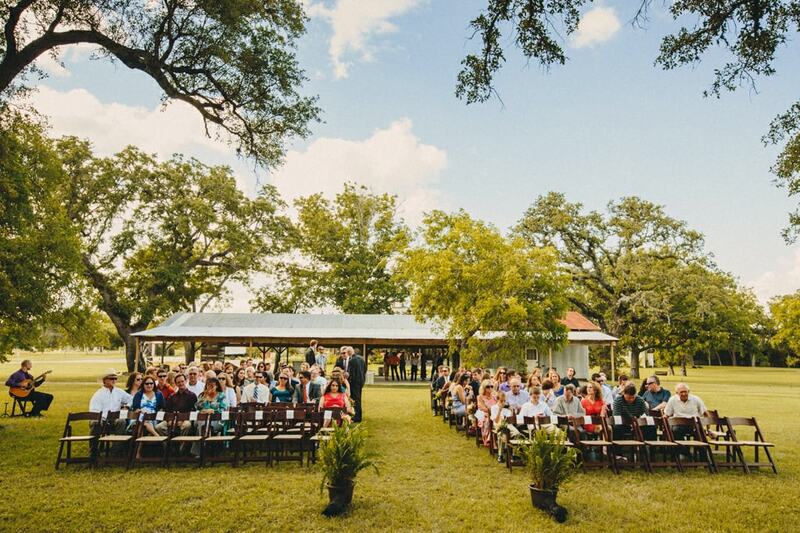 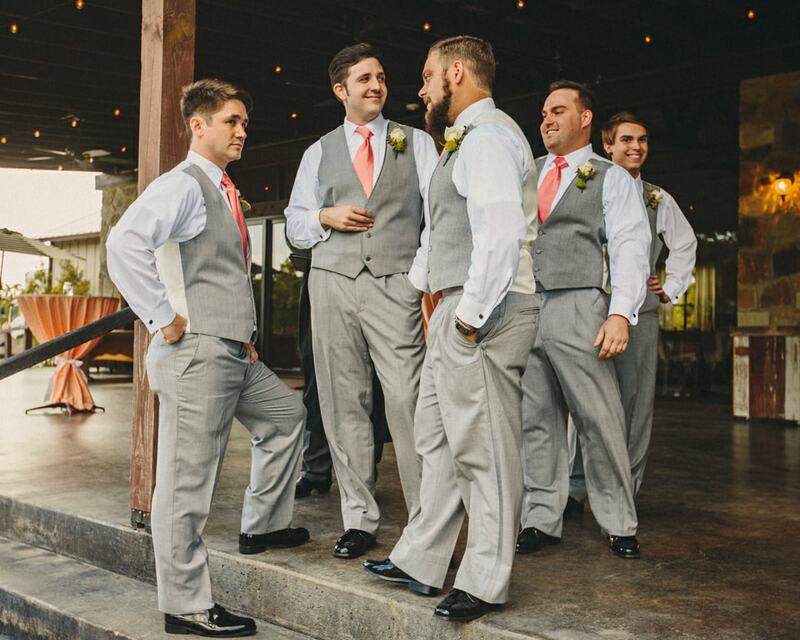 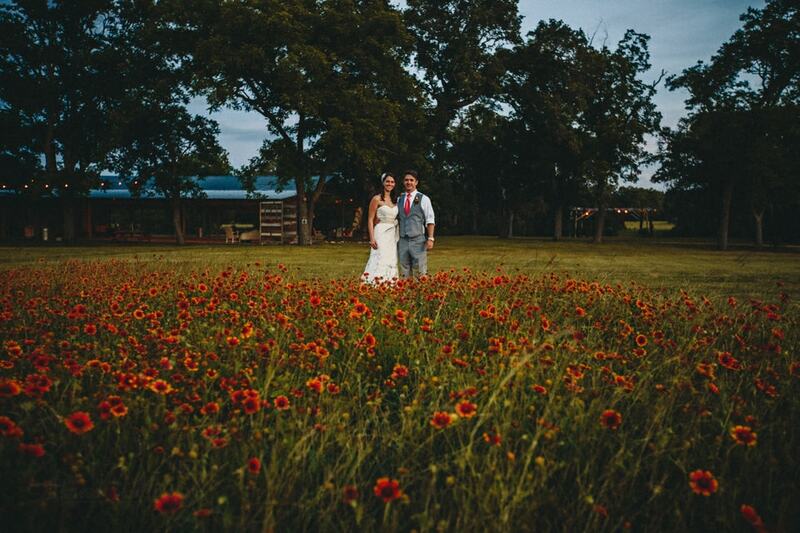 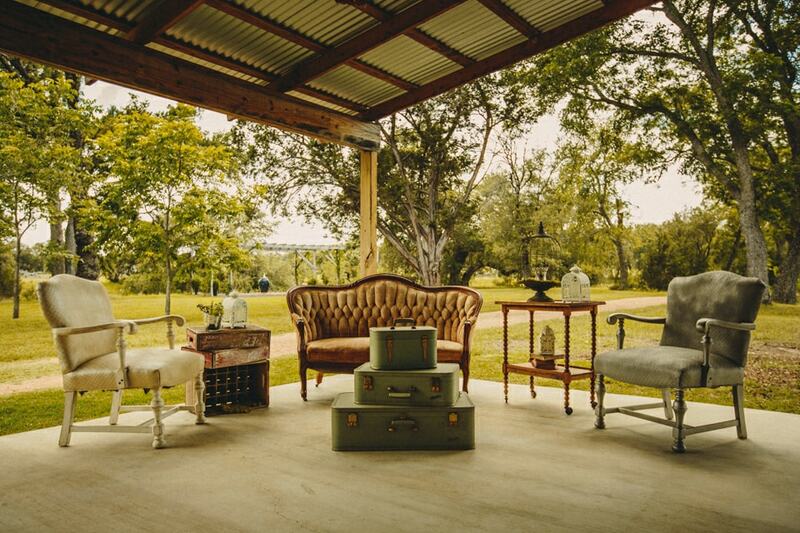 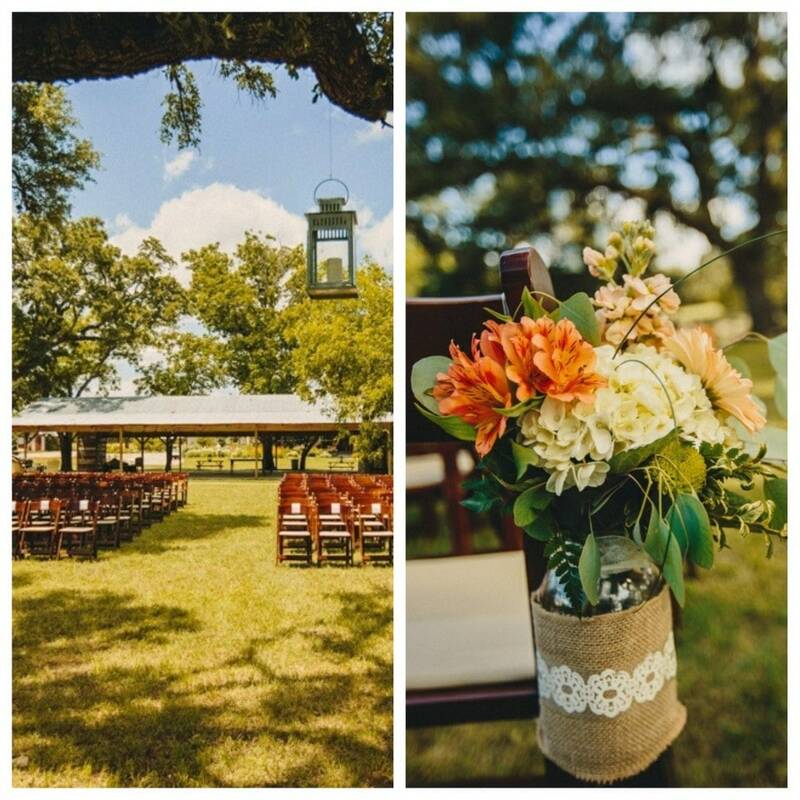 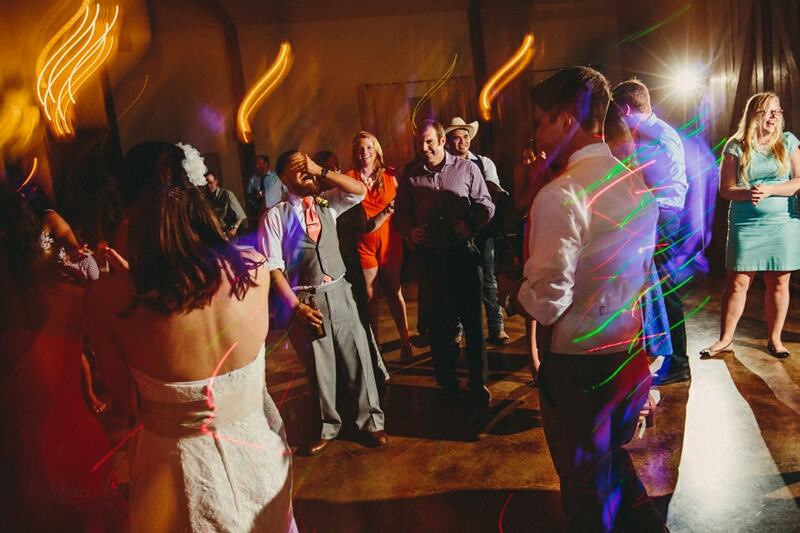 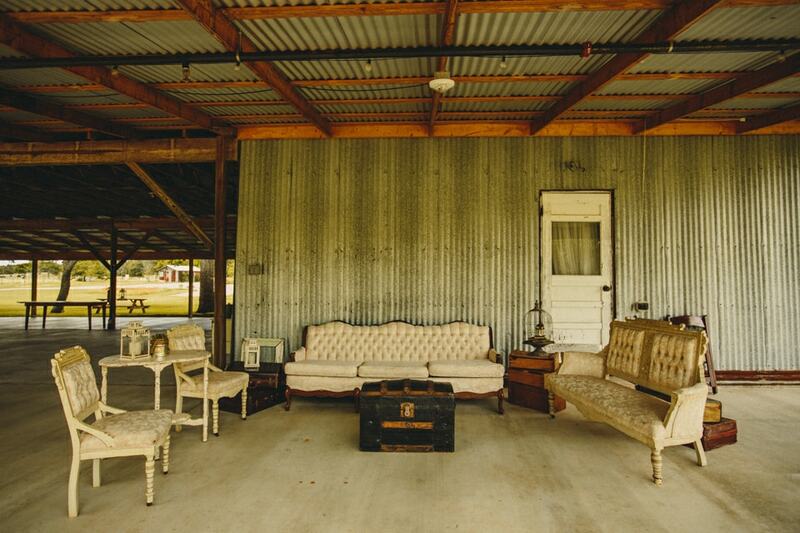 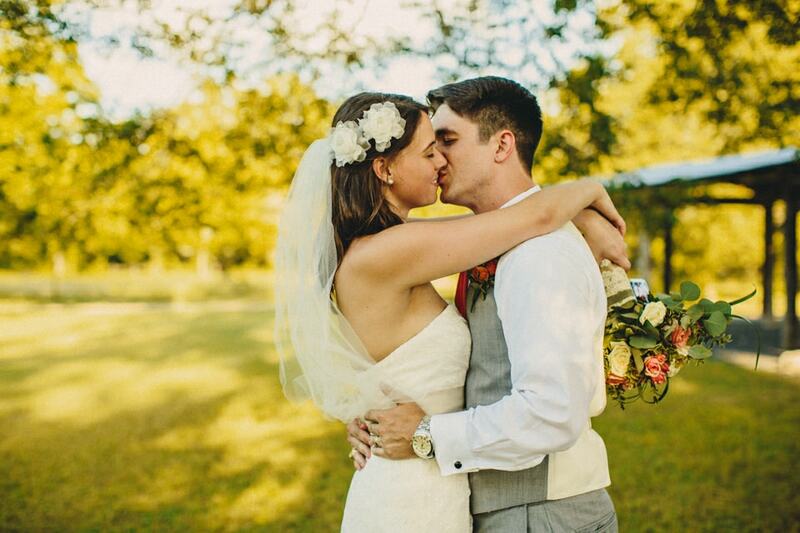 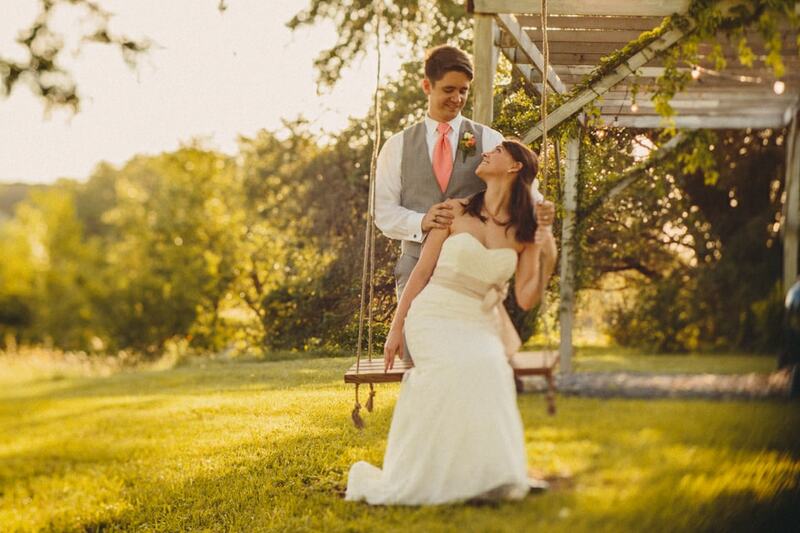 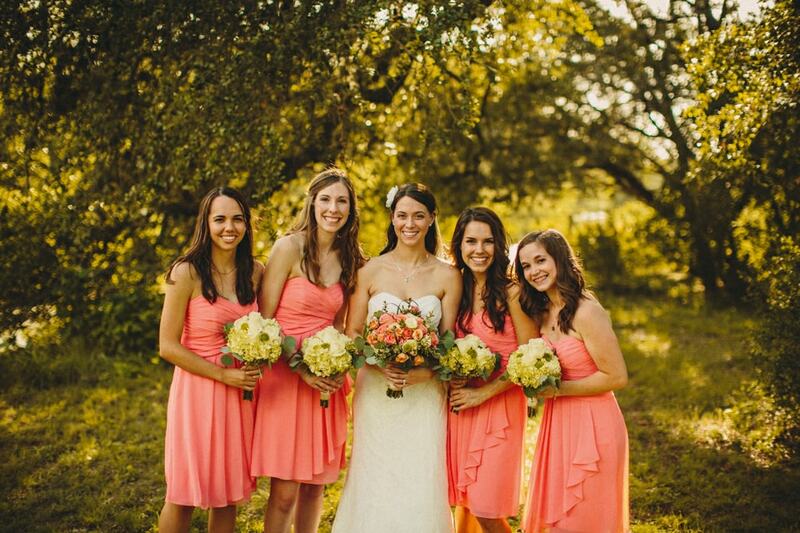 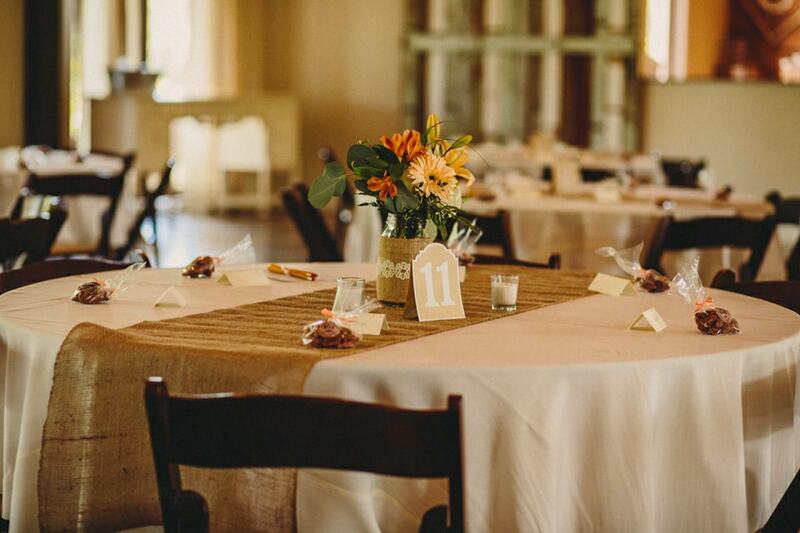 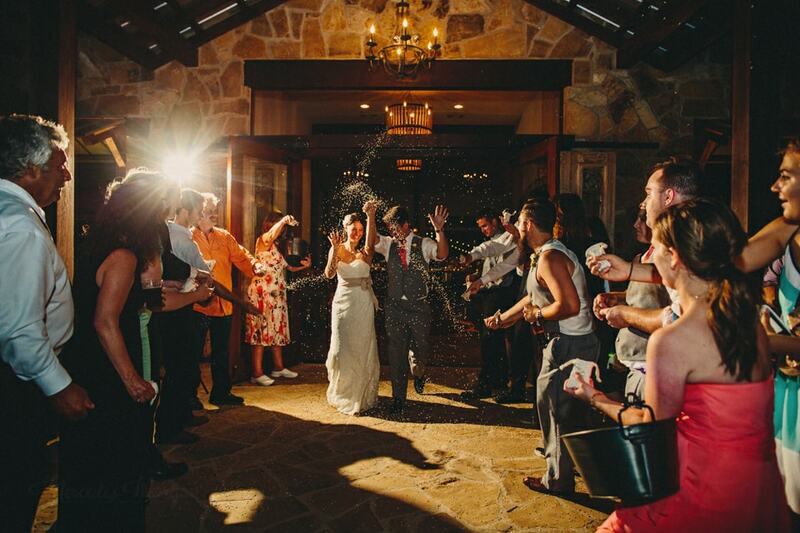 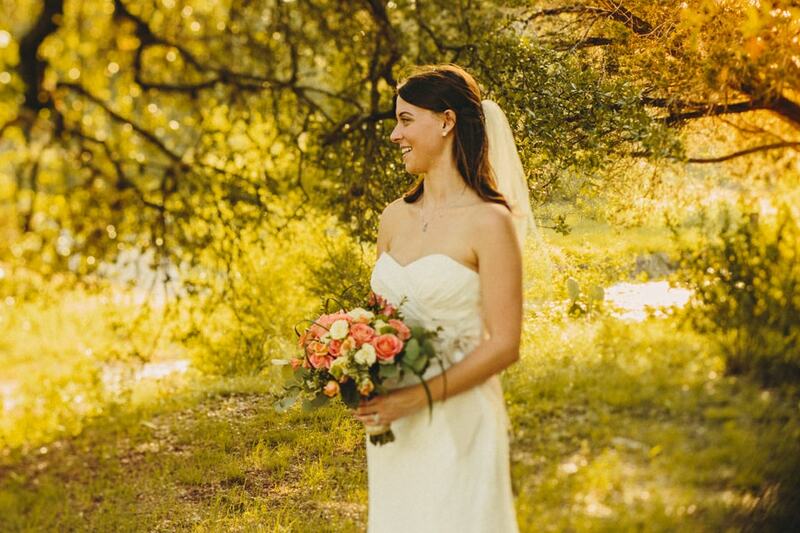 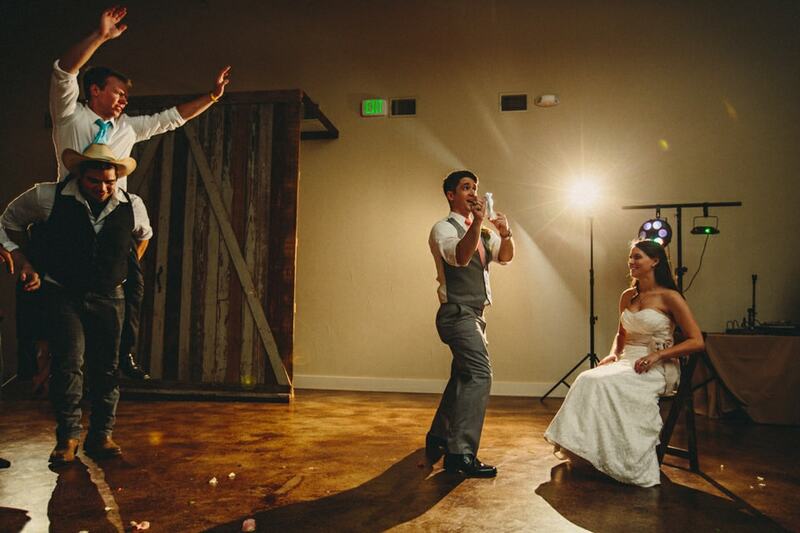 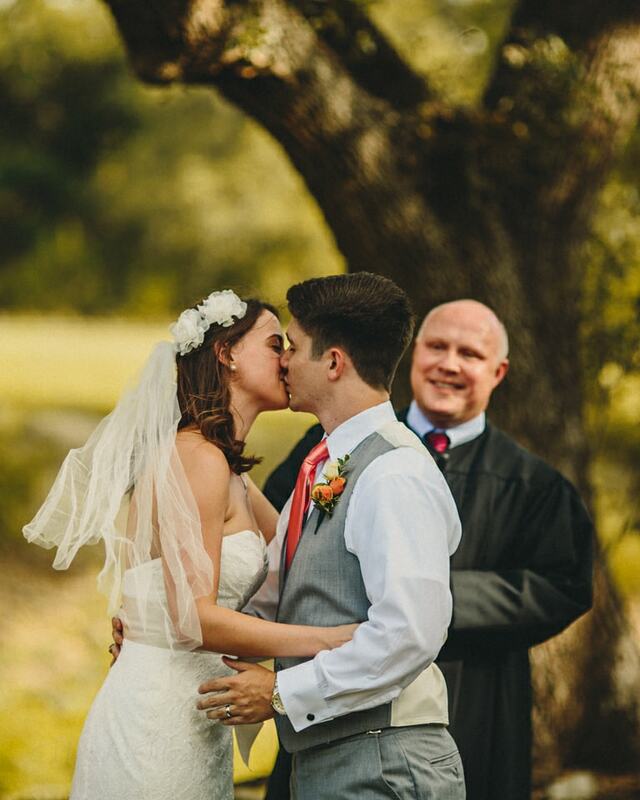 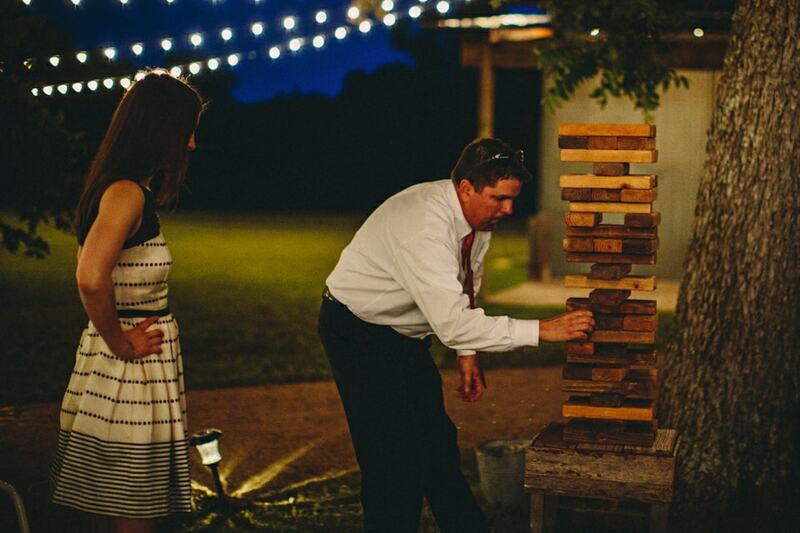 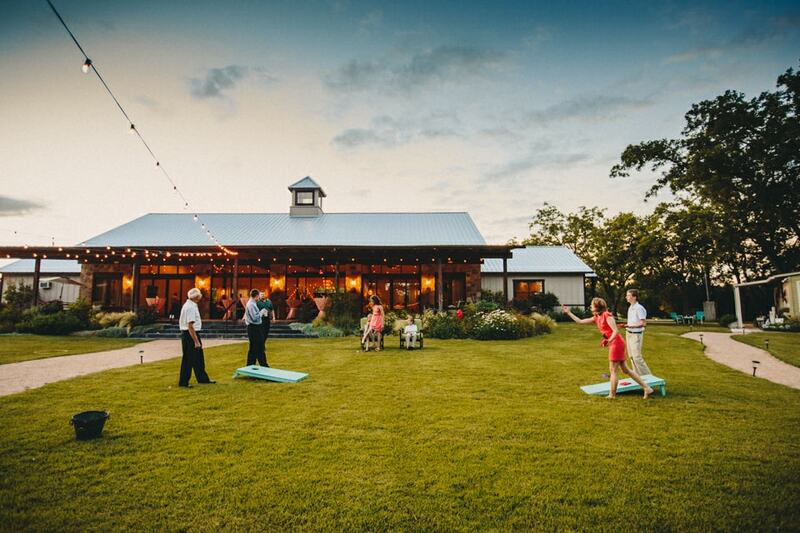 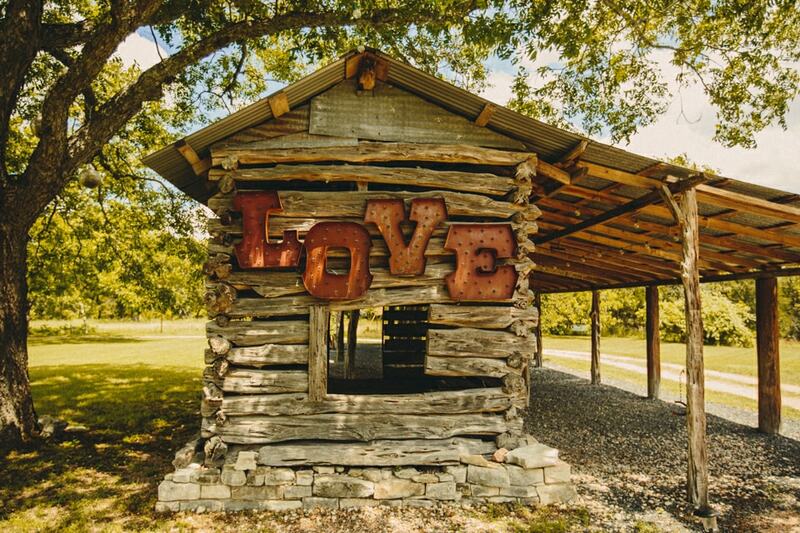 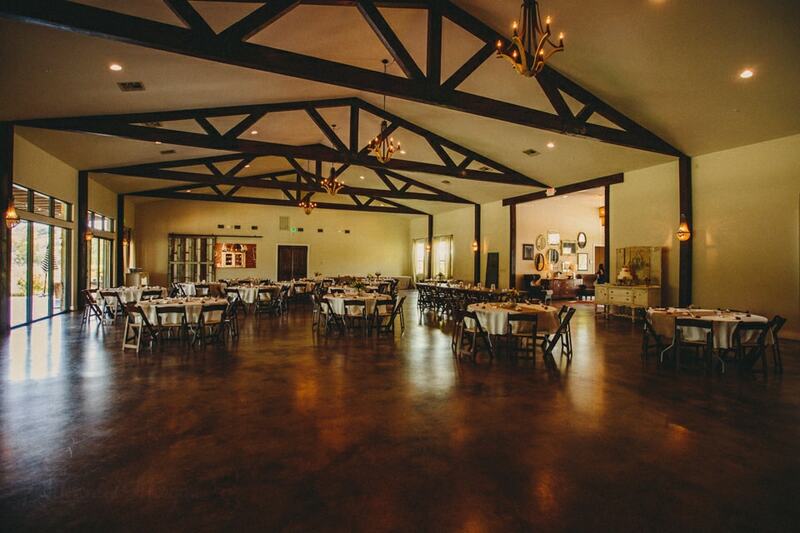 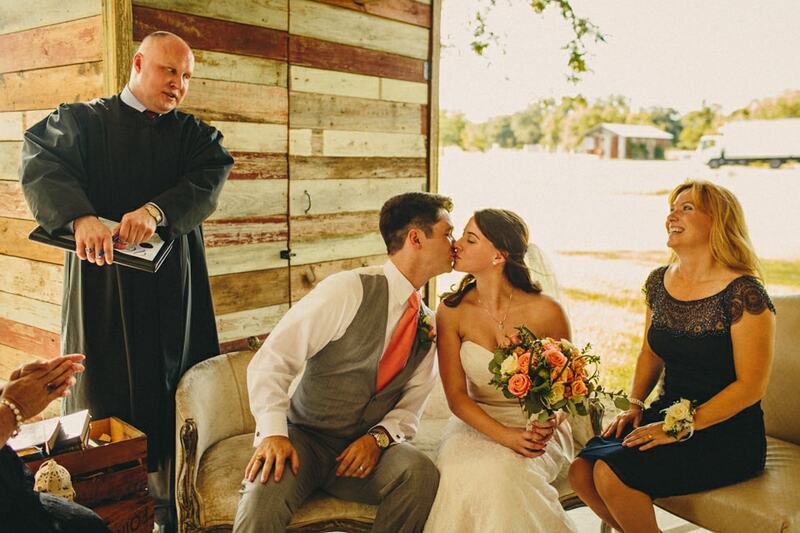 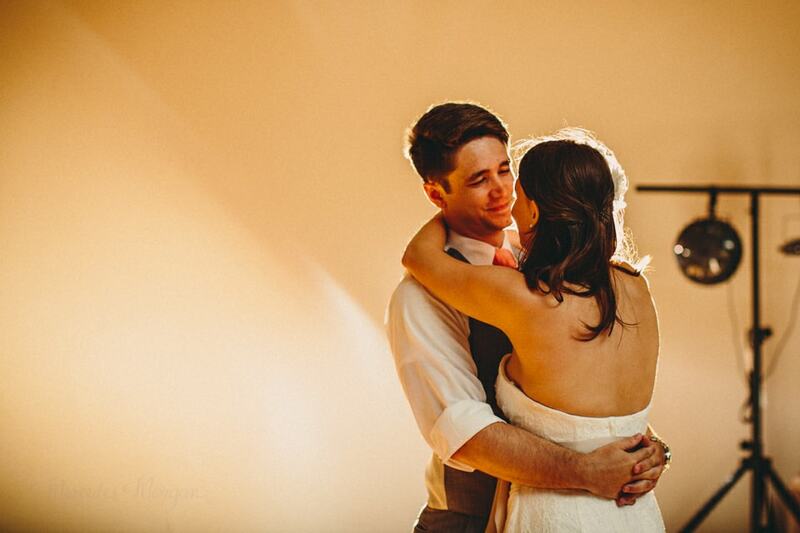 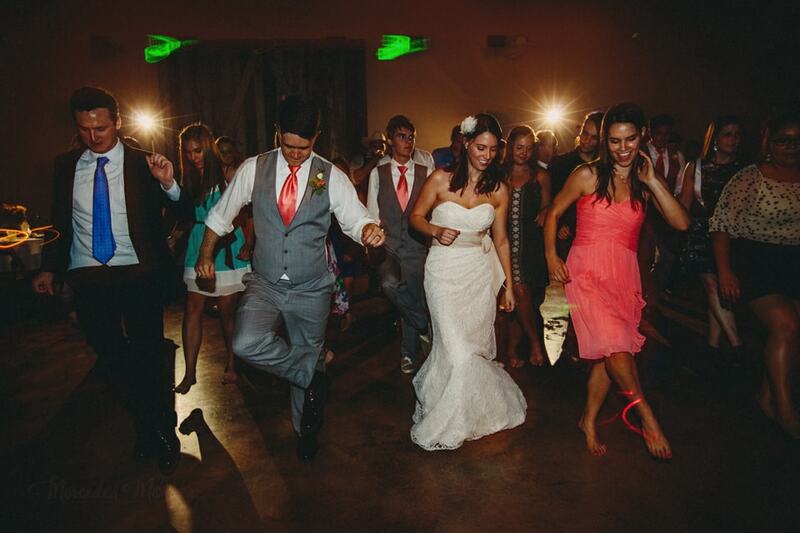 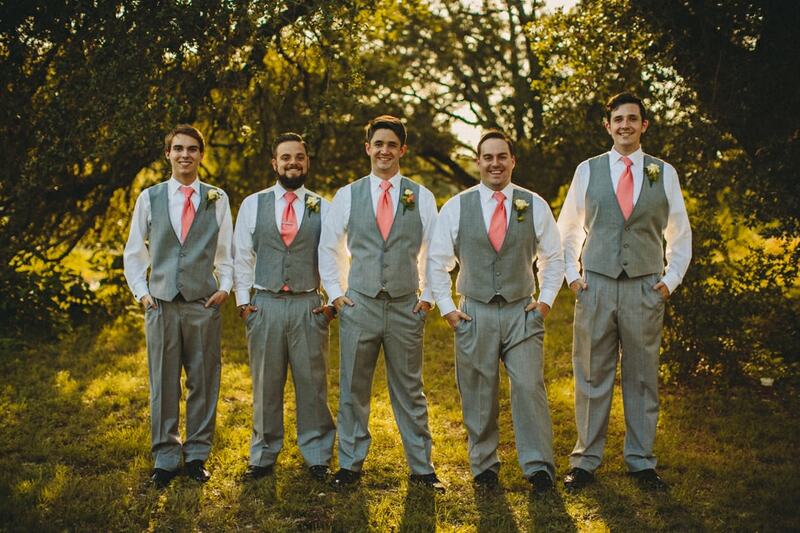 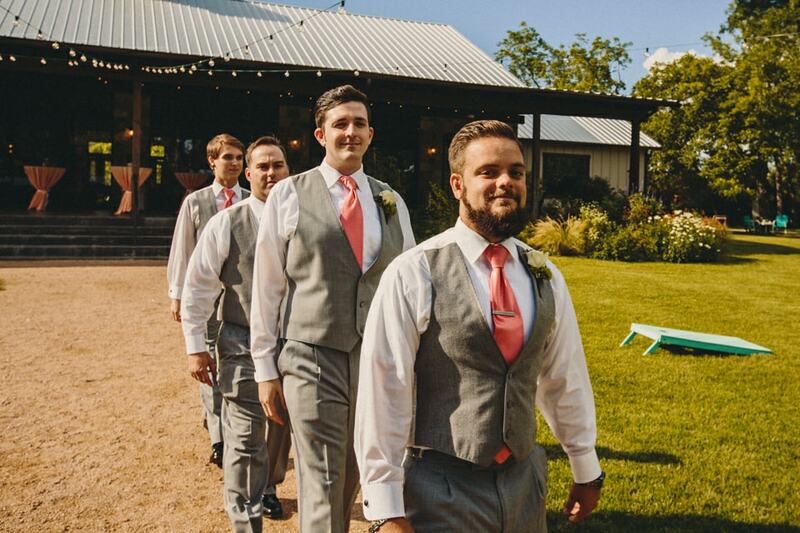 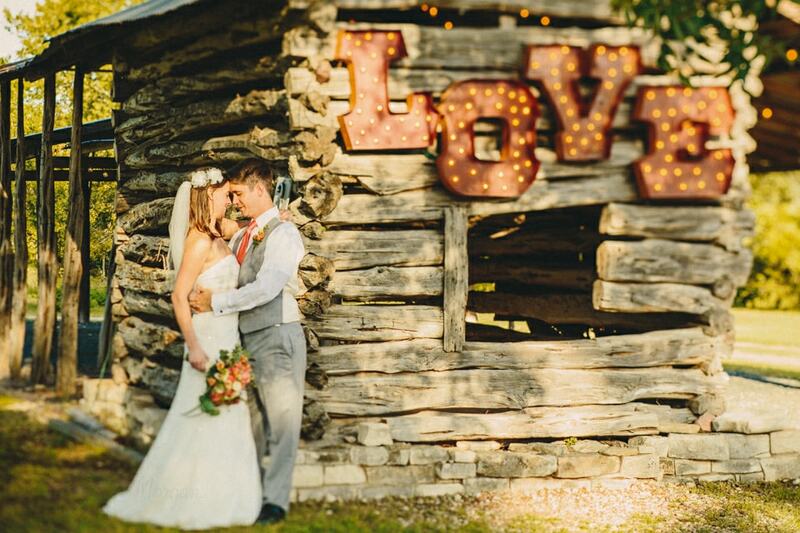 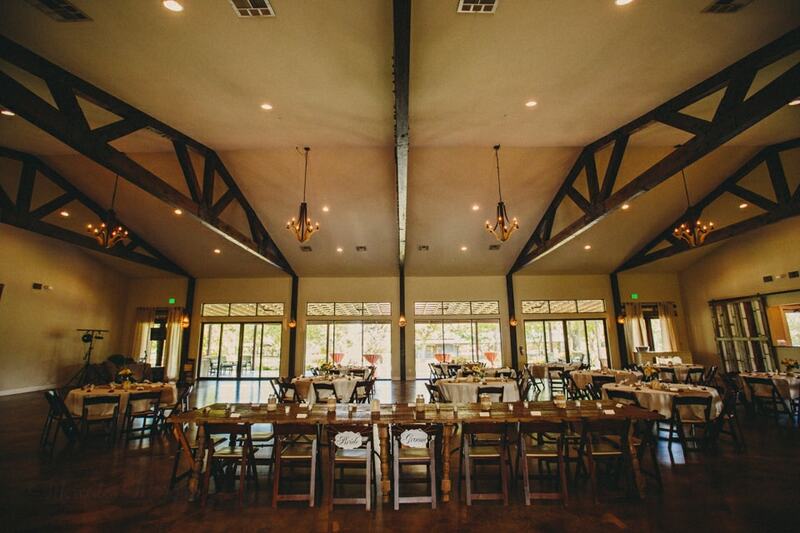 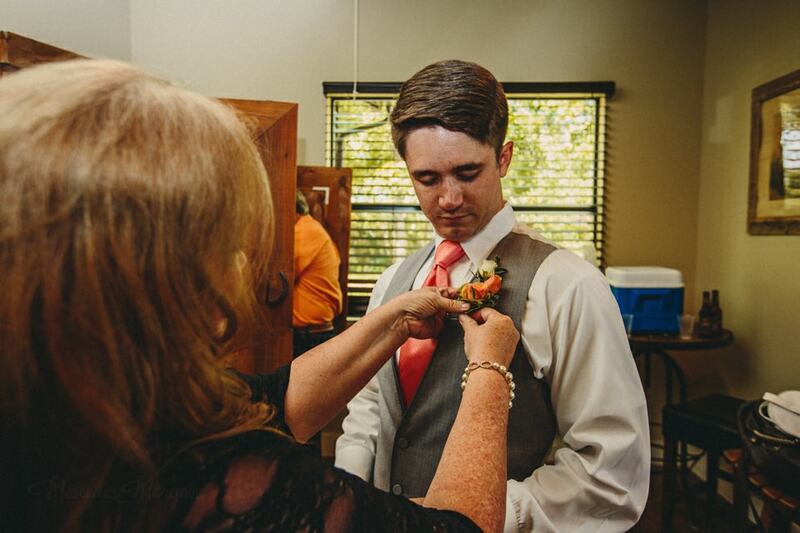 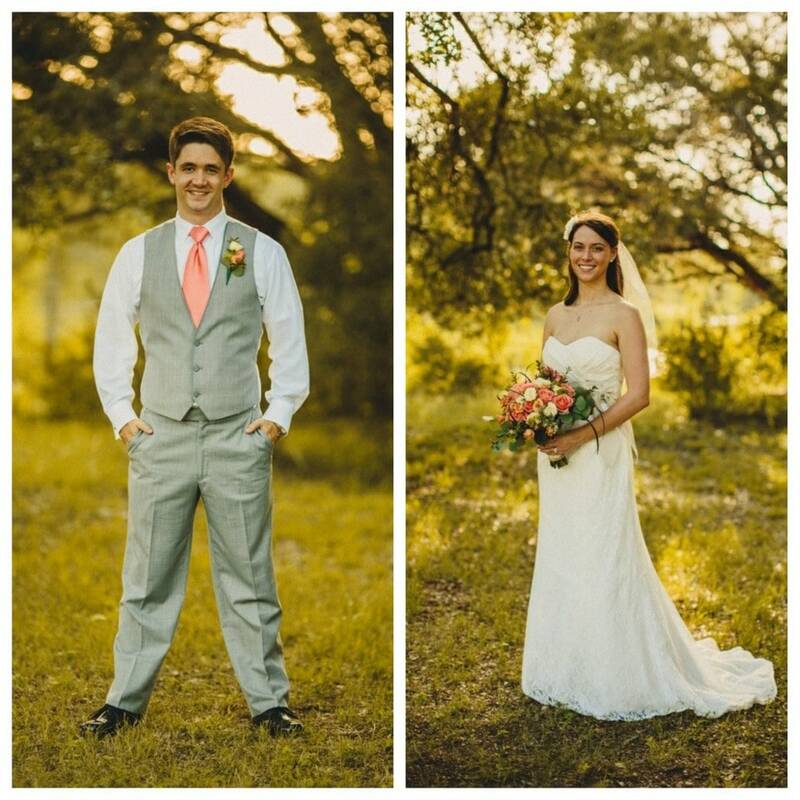 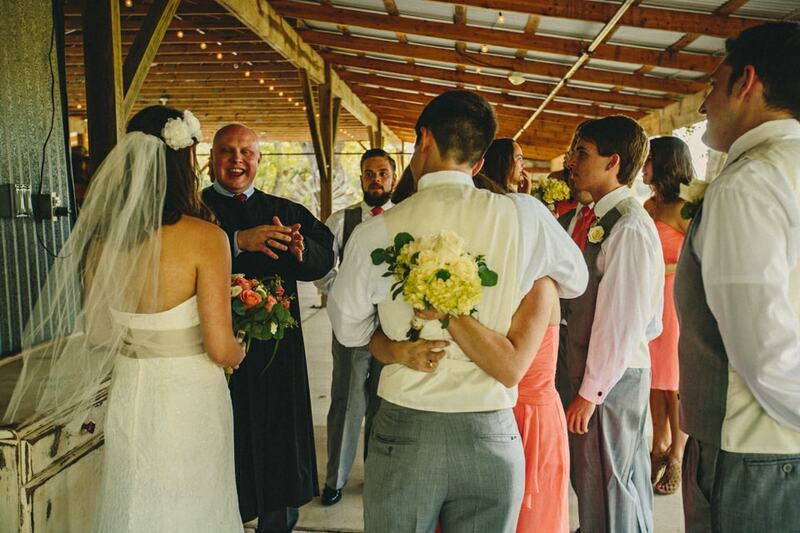 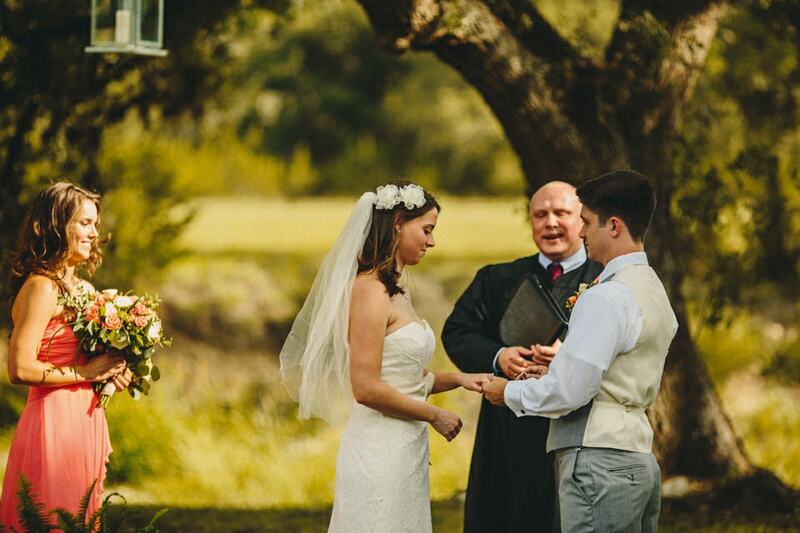 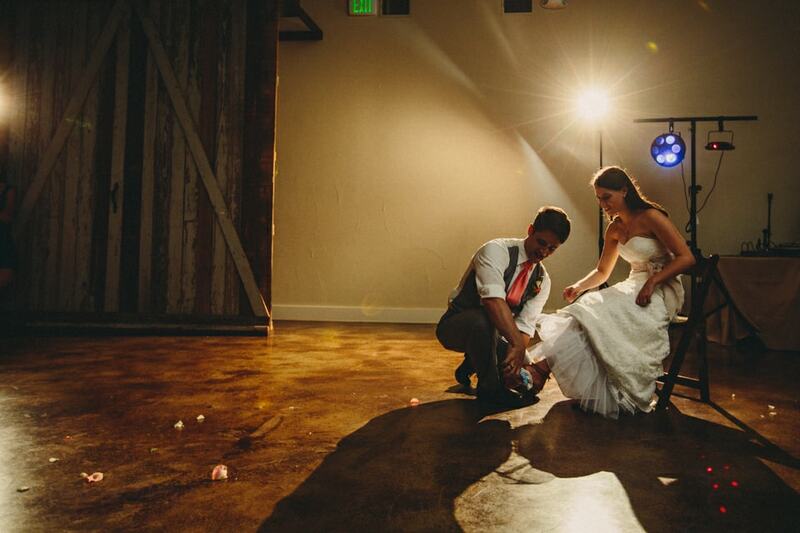 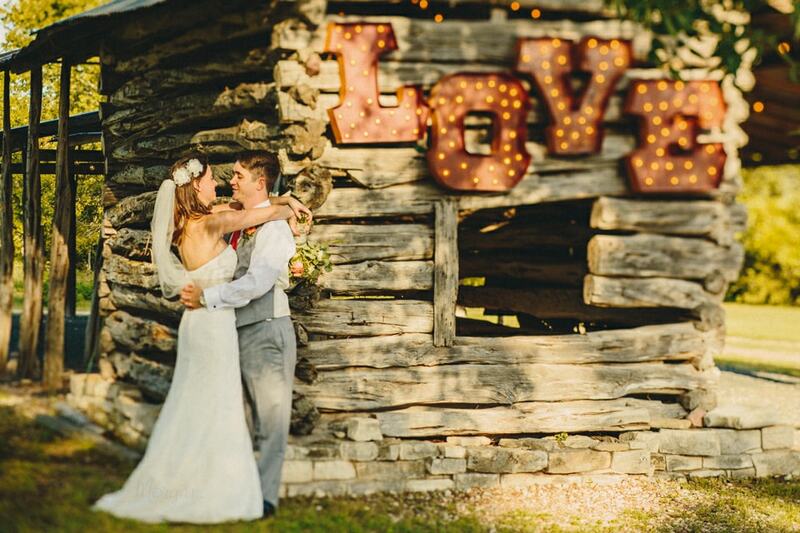 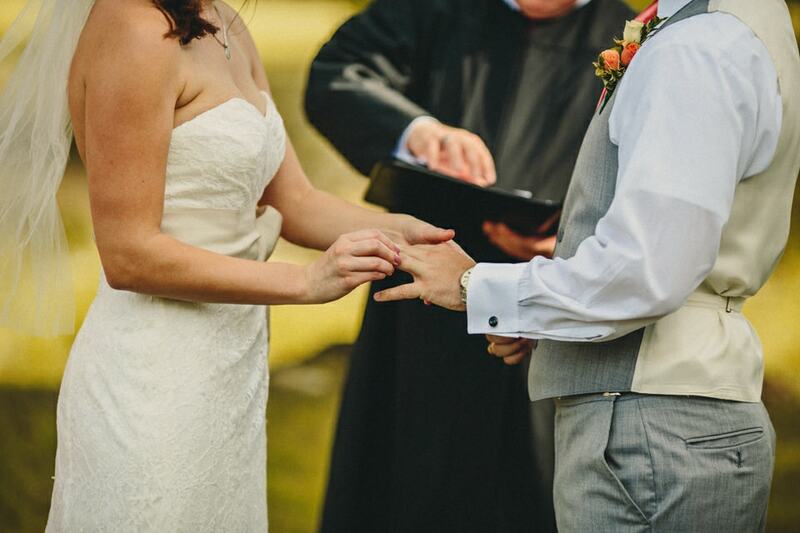 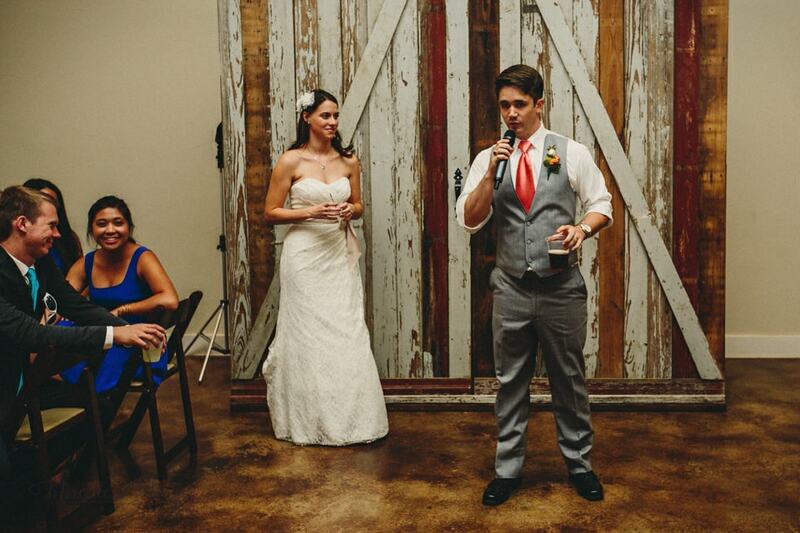 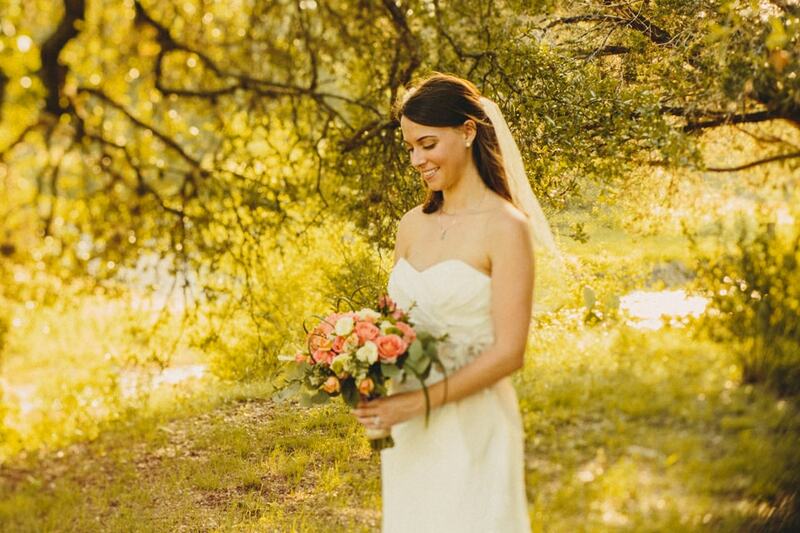 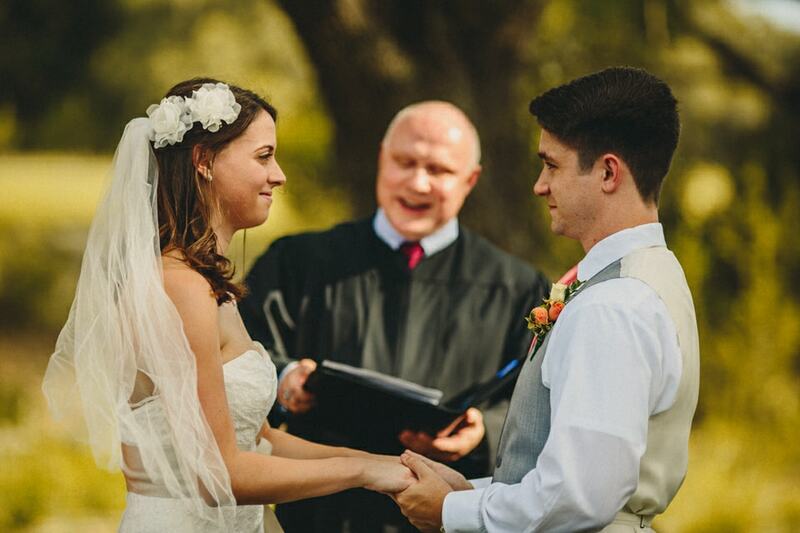 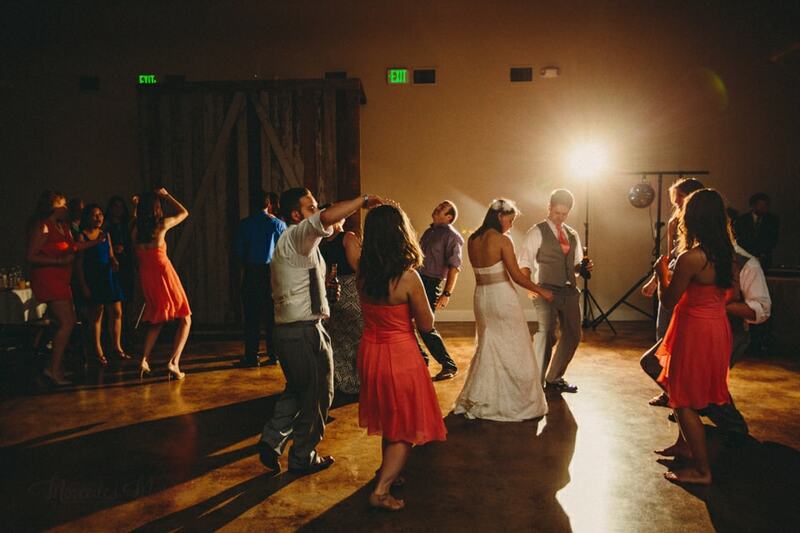 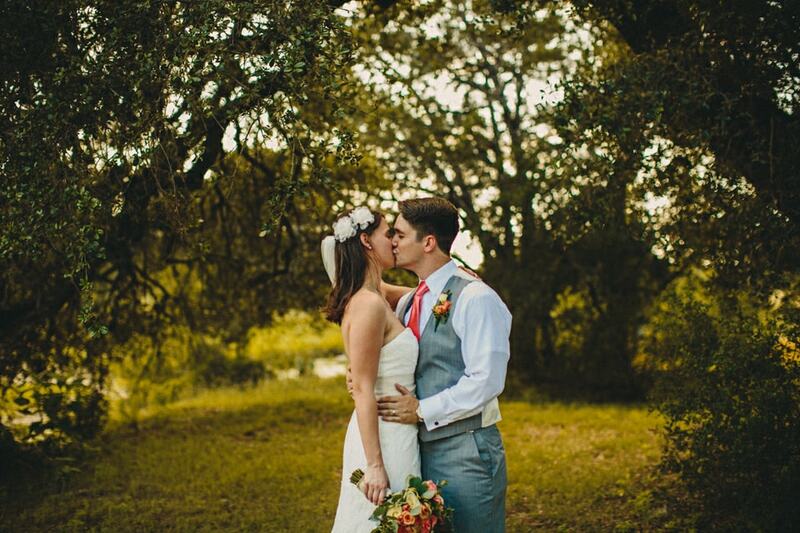 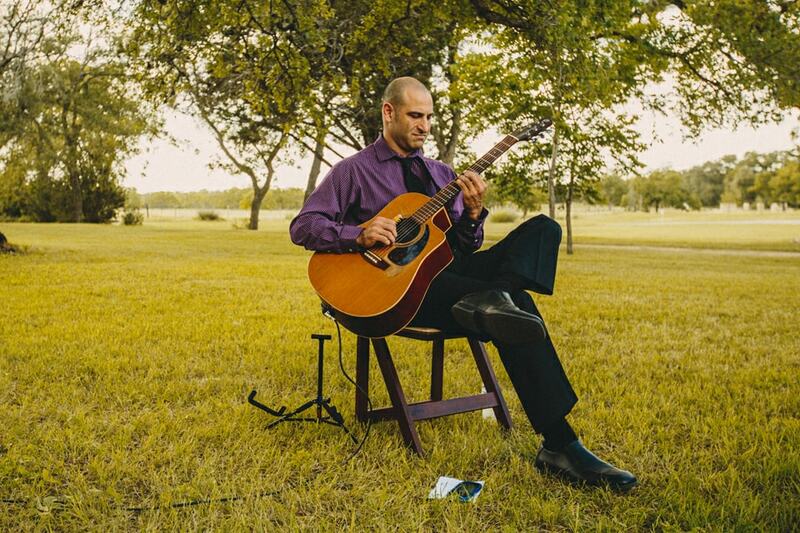 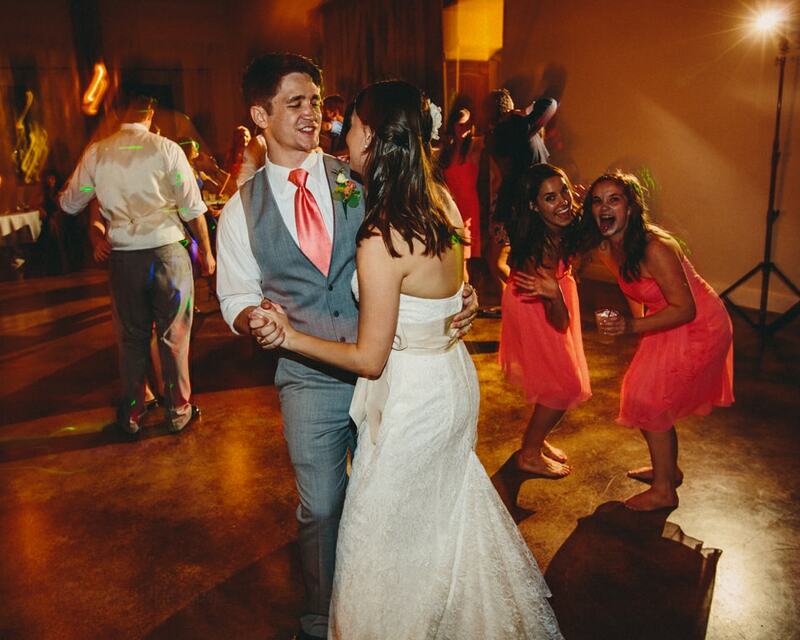 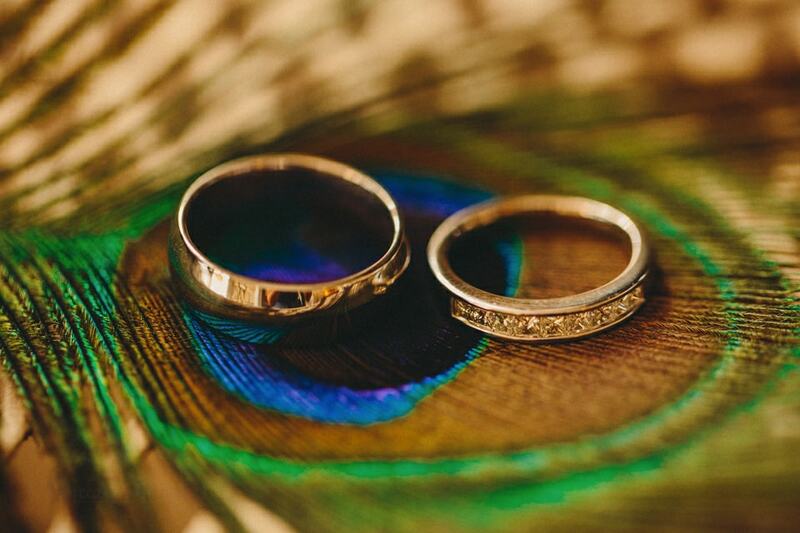 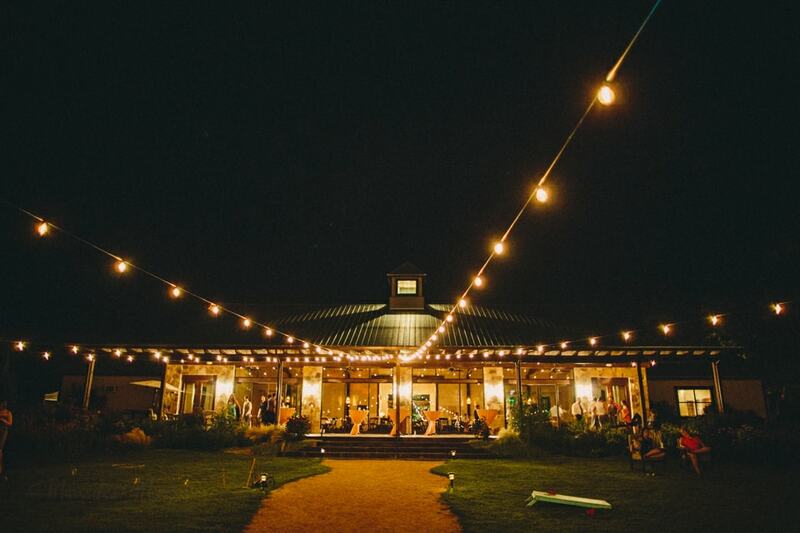 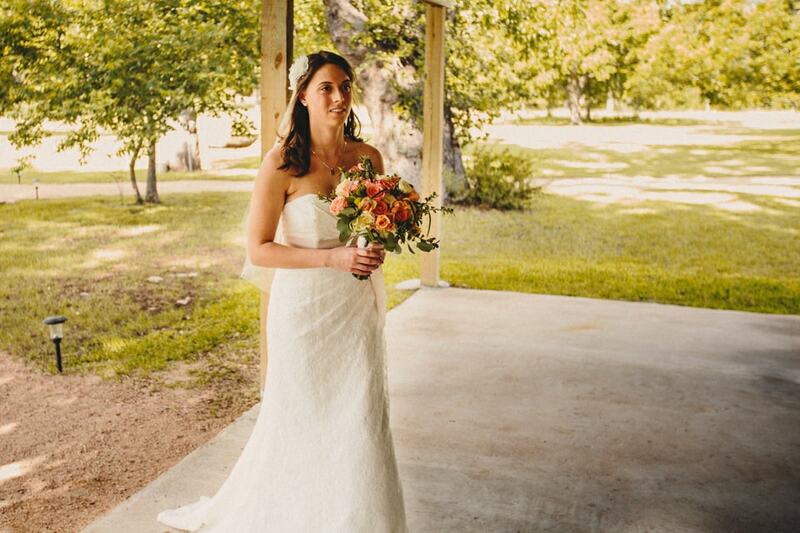 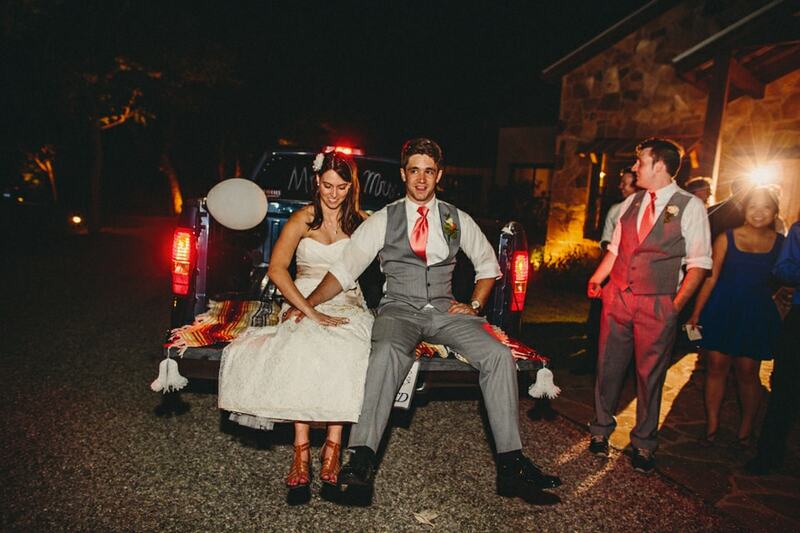 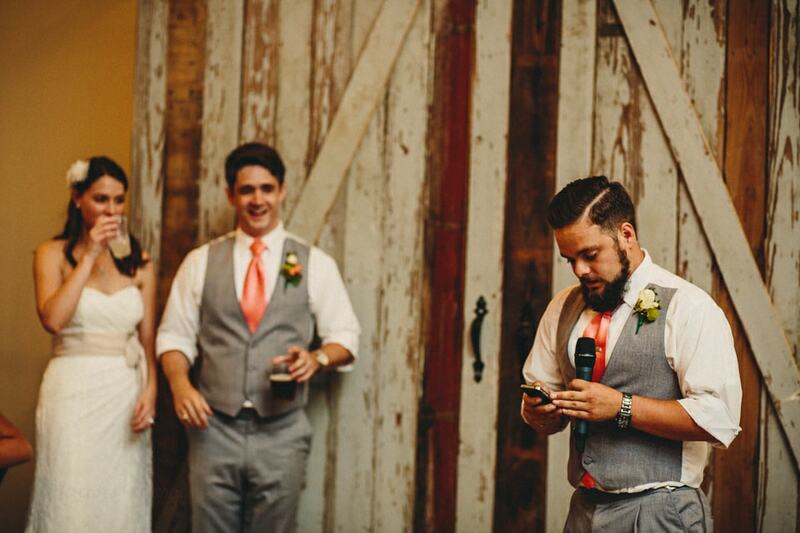 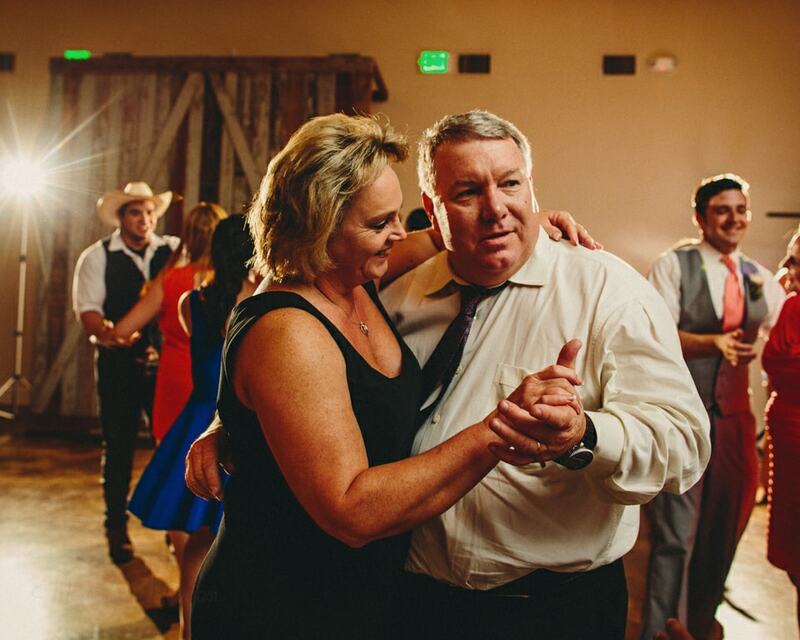 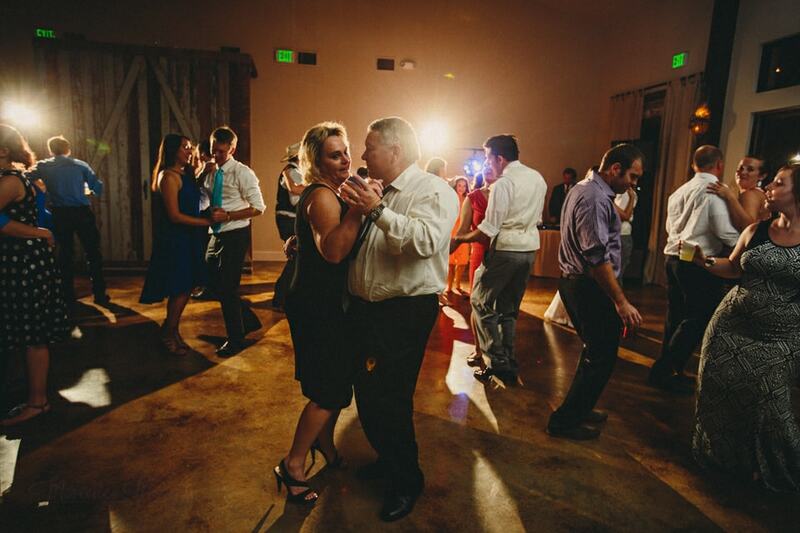 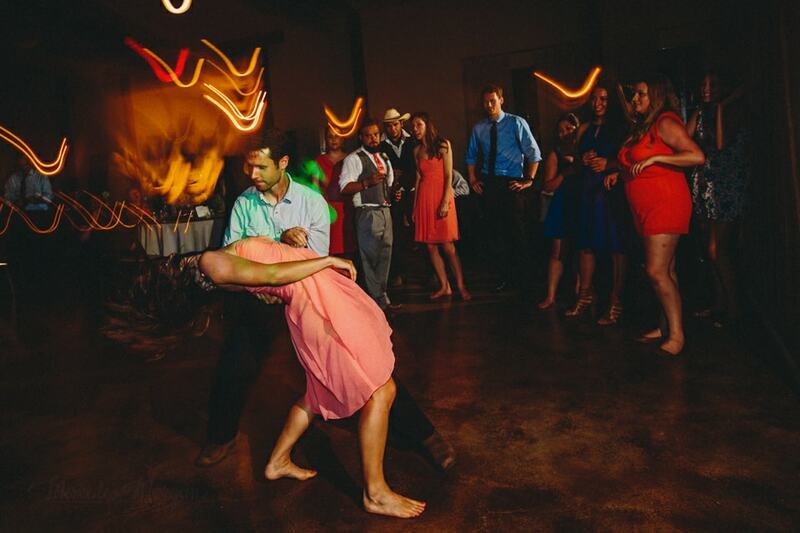 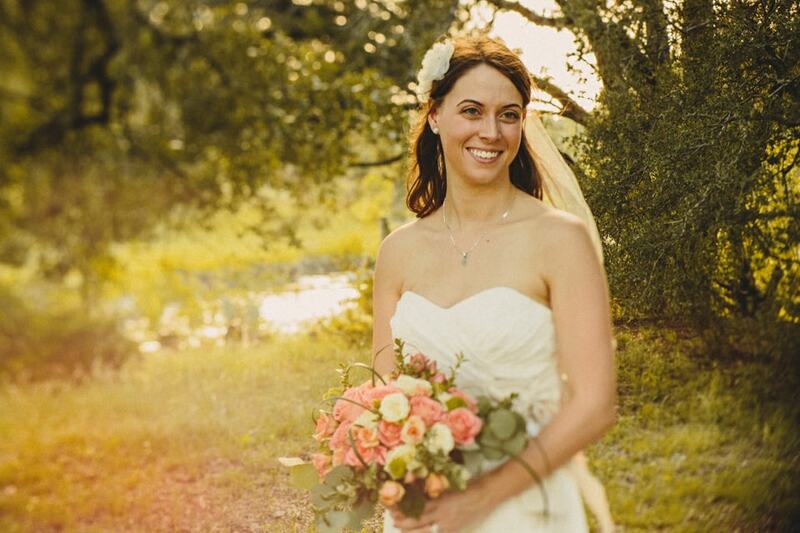 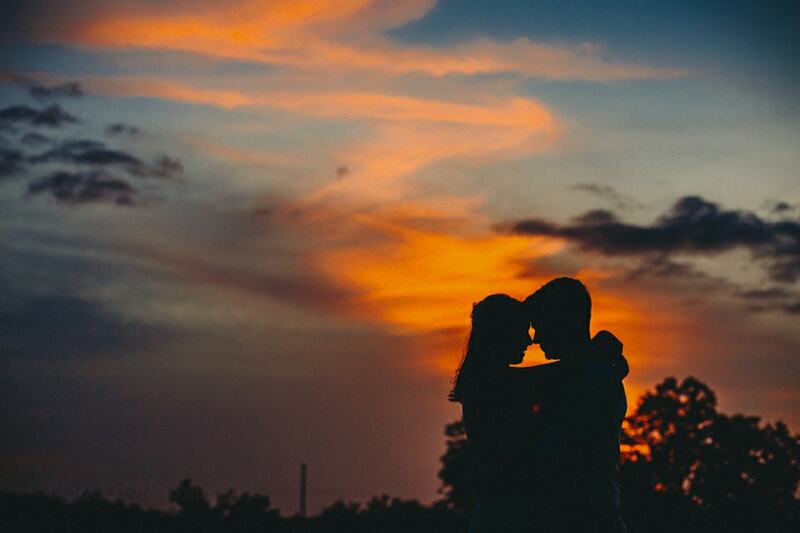 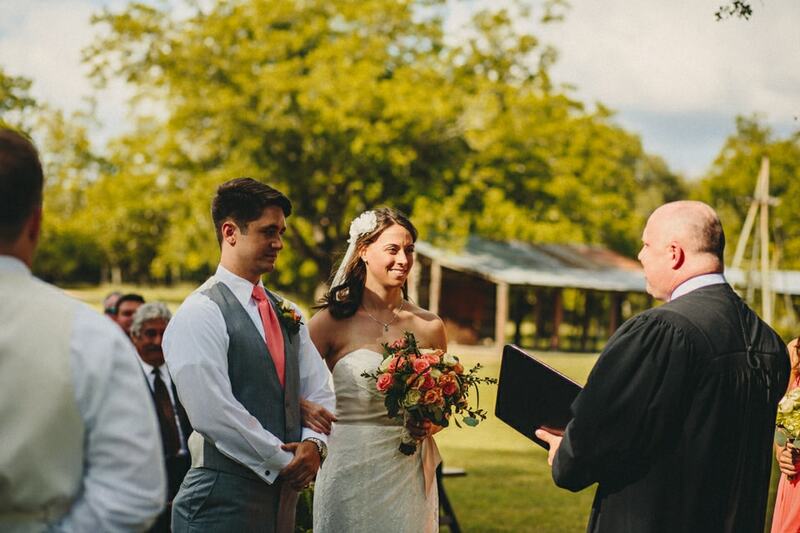 Thank you so much to Mercedes for sharing this stunning Texas Ranch Wedding. 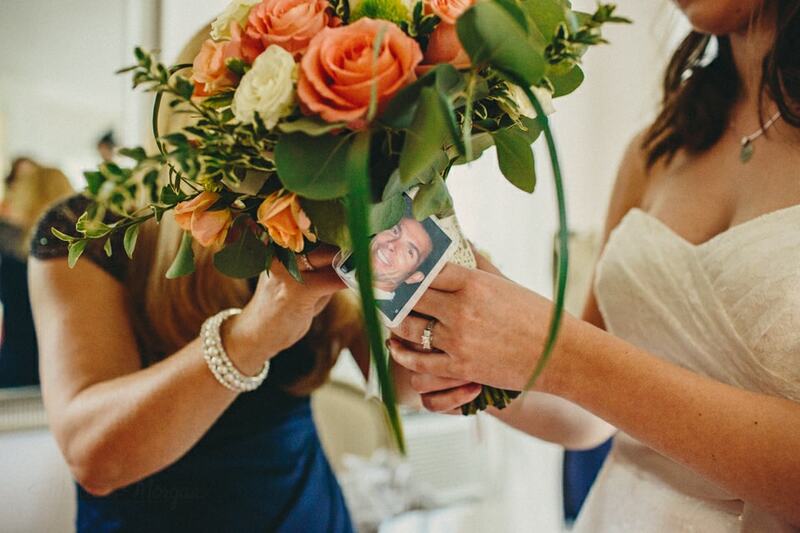 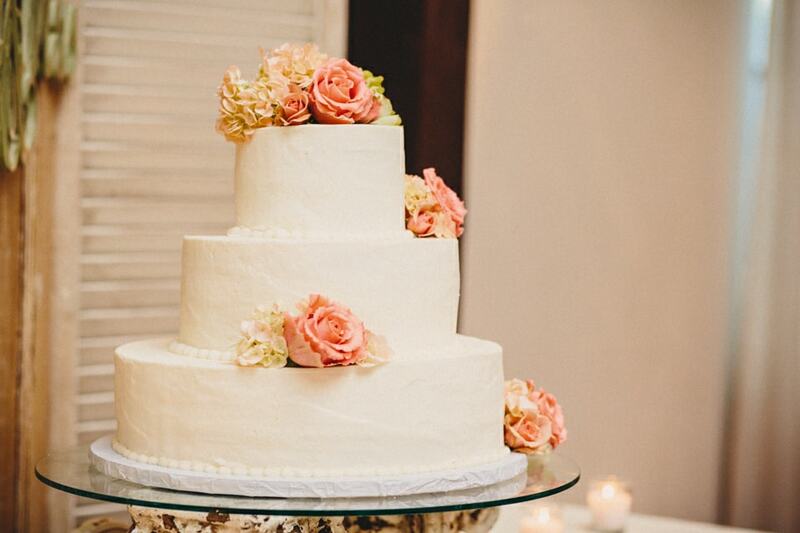 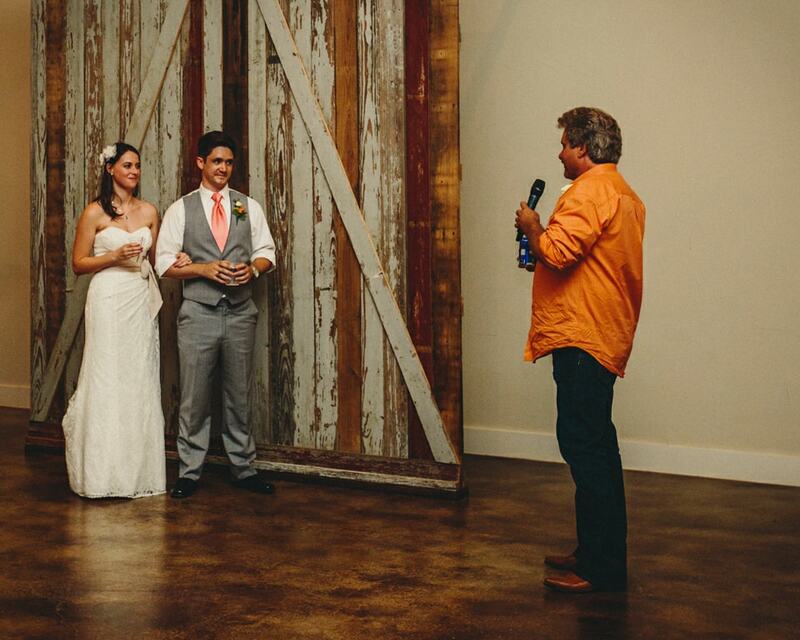 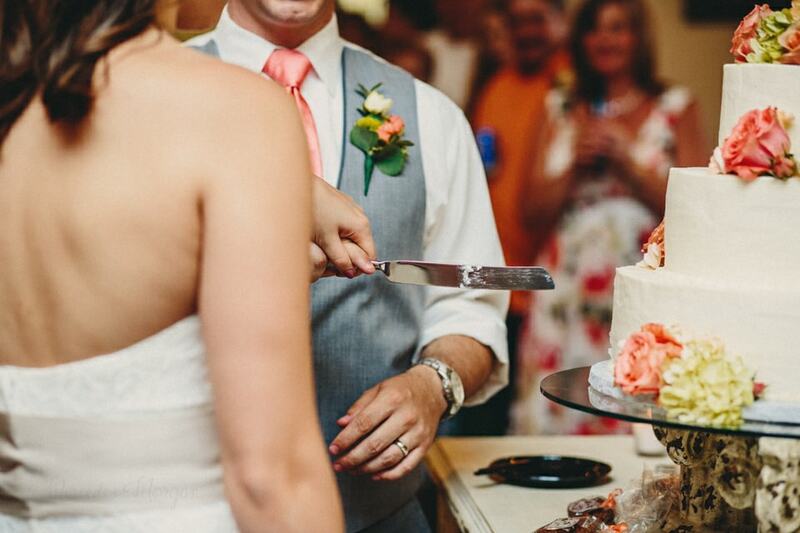 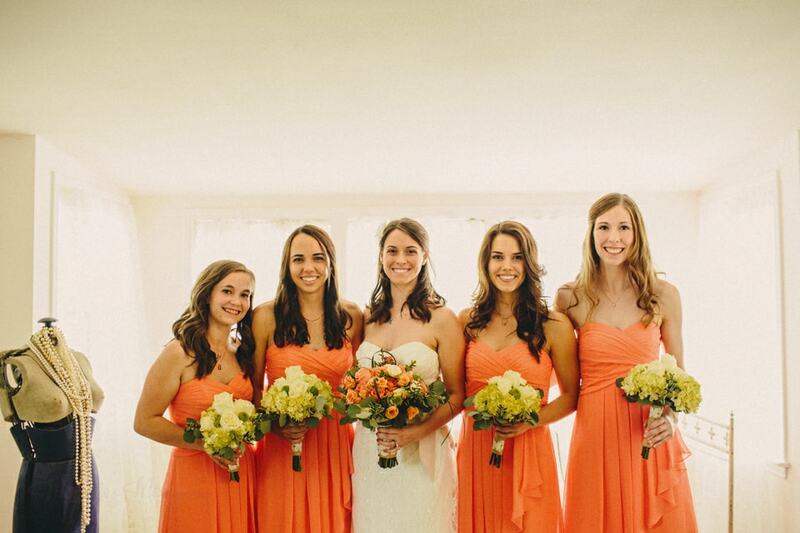 Love the gorgeous peach and ivory palette bringing warmth to the celebration.